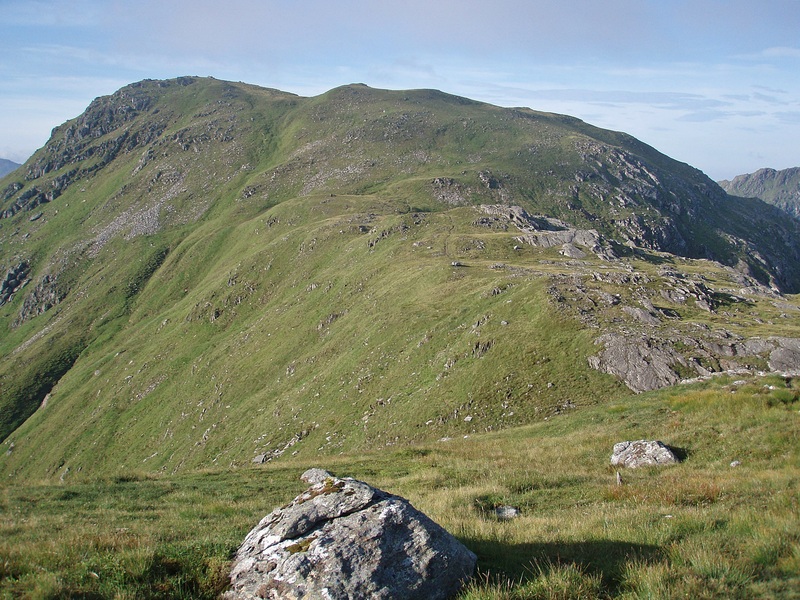 On previous occasions I had climbed these Munros separately but I had always wanted to walk along the connecting ridge between the two. 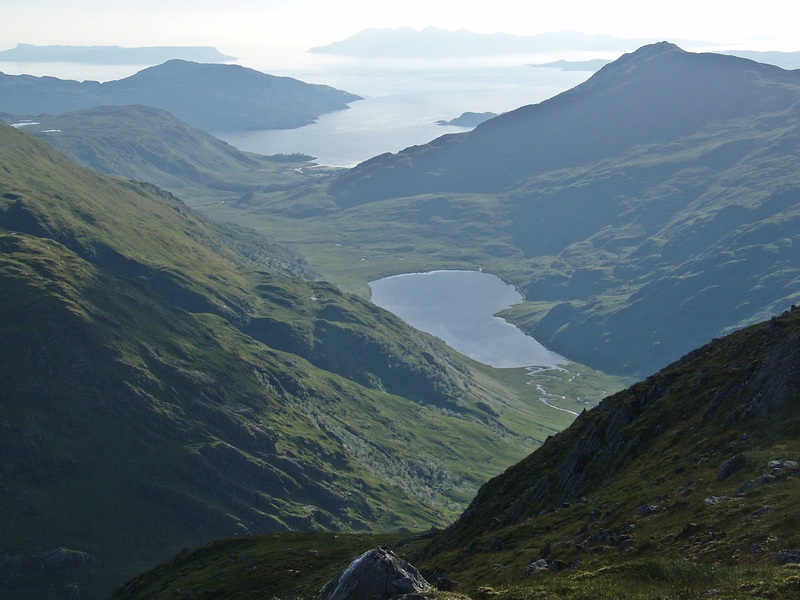 I knew I wouldn’t manage the walk in from Kinloch Hourn, the ascent of the two hills and the walk out all in one day, so I planned a route with a camp on the bealach in between. 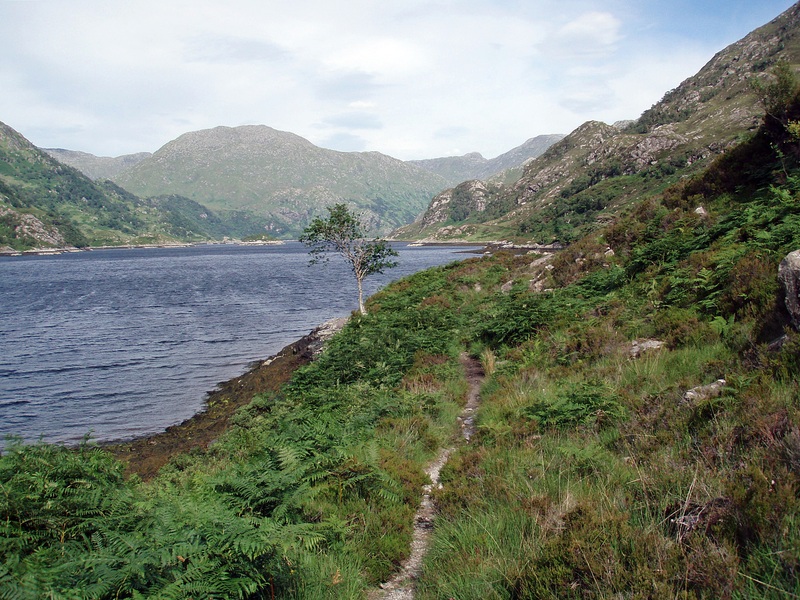 I started from the long stay car park in Kinloch Hourn at 10:30 and walked along the familiar path on the S side of Loch Hourn. I had my lunch in Barisdale Bothy. 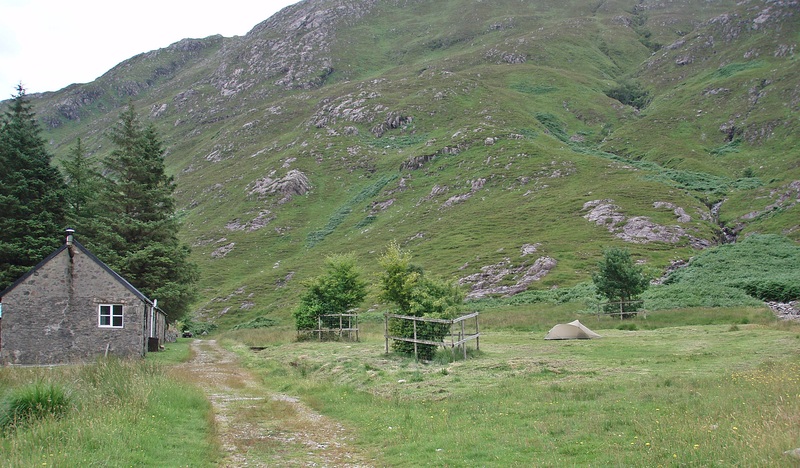 There was only one tent pitched outside the bothy – quite a difference to my last visit in April! 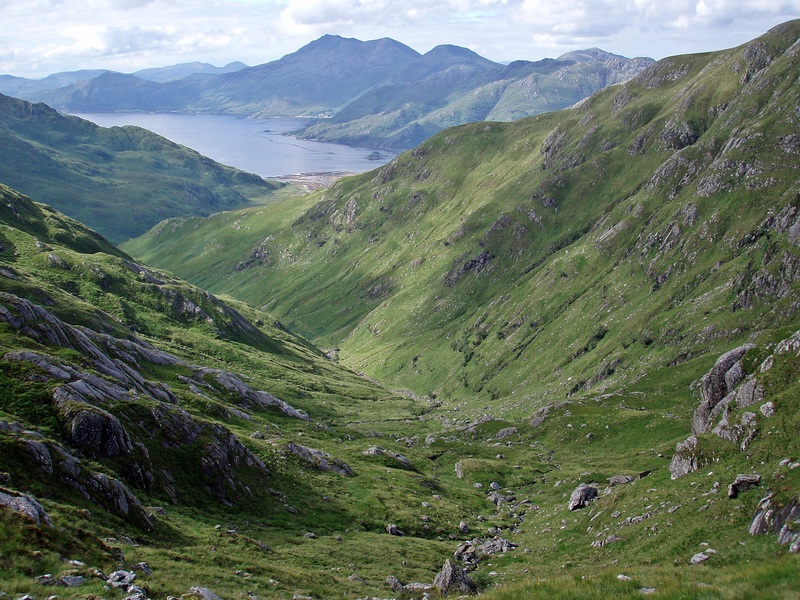 Heading up Gleann Unndalain I got a nice view back to Barrisdale Bay. 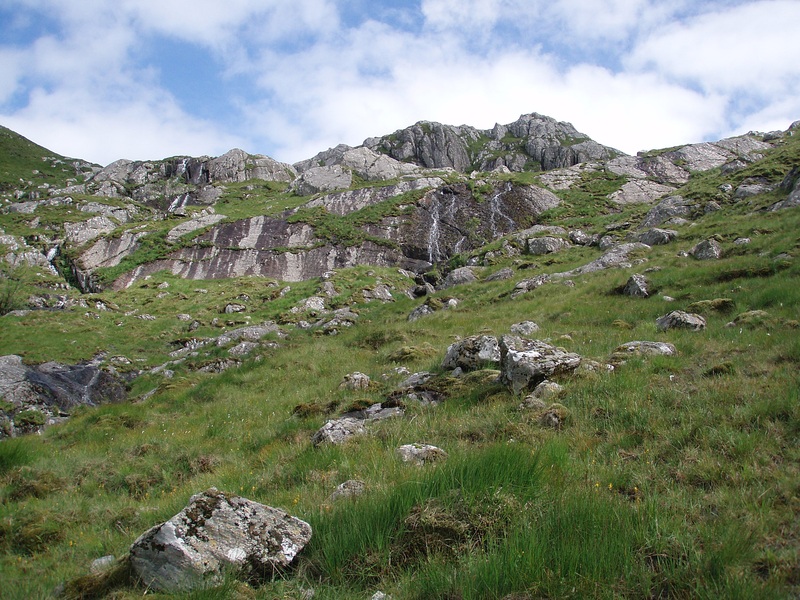 I had planned to continue to the top of Màm Unndalain and join Luinne Bheinn’s E ridge from there, but where the path traverses below this water slide I decided to take a shortcut and ascend the ridge to the right of the rock slabs. 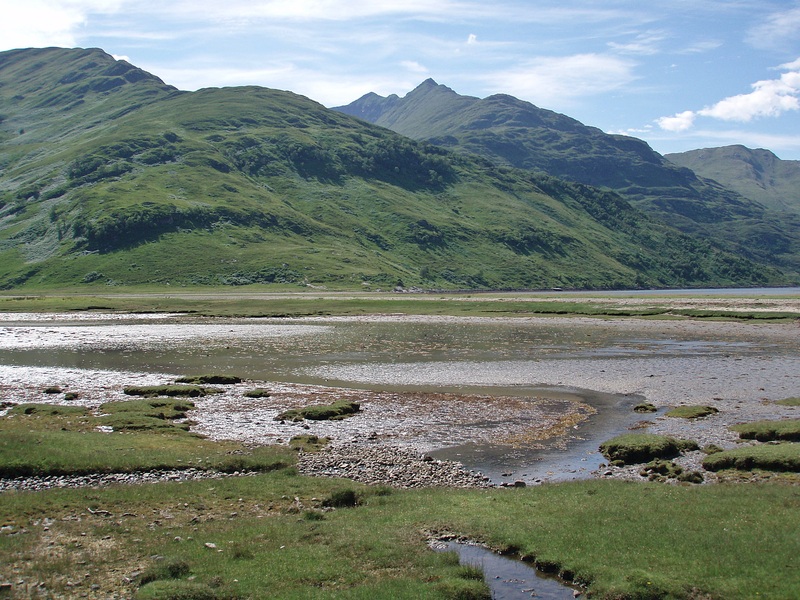 Gleann Unndalain, with Beinn Sgritheall in the distance. 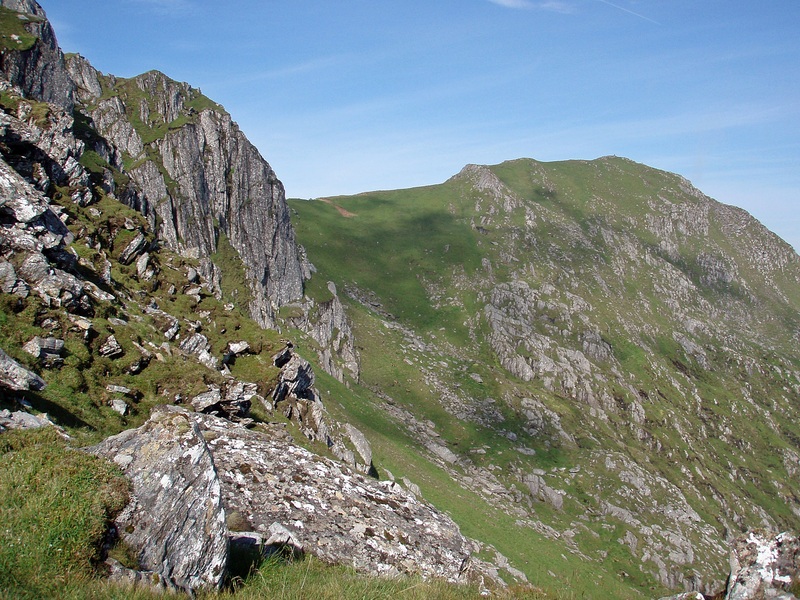 Once on the ridge I had to wind my way around crags and buttresses but on a day like today the route finding was straightforward. 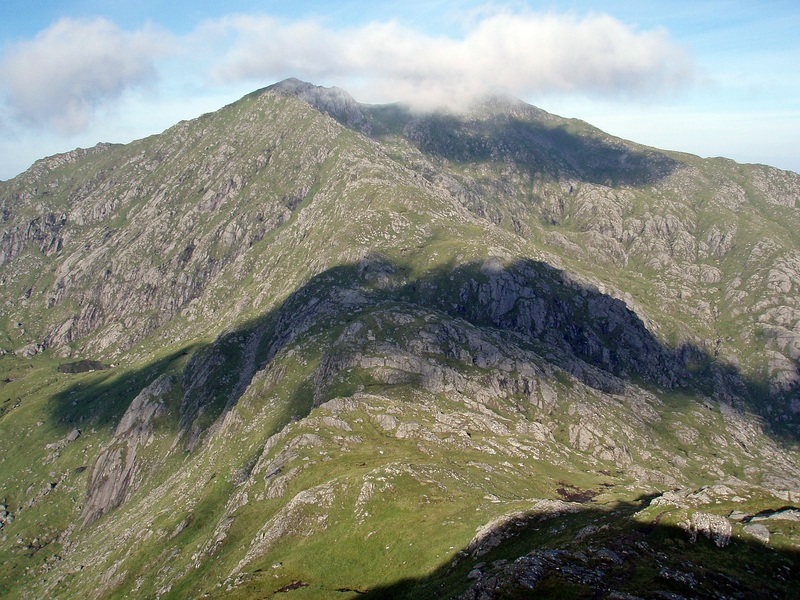 Ben Aden and Sgùrr na Cìche. 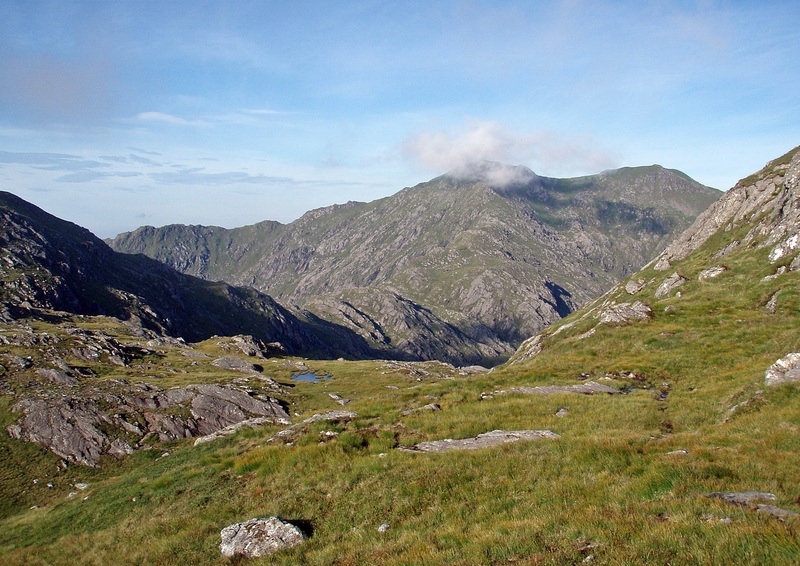 Sgùrr na Cìche above the River Carnach. 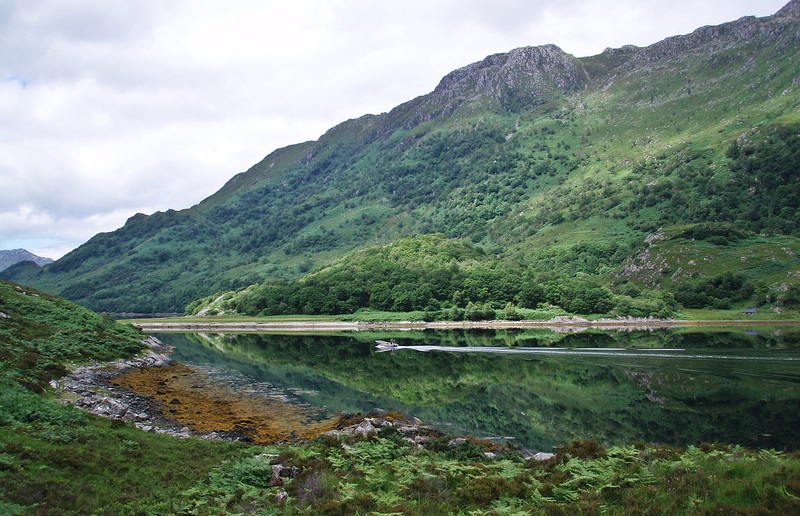 Lochan nam Breac and Loch Quoich. 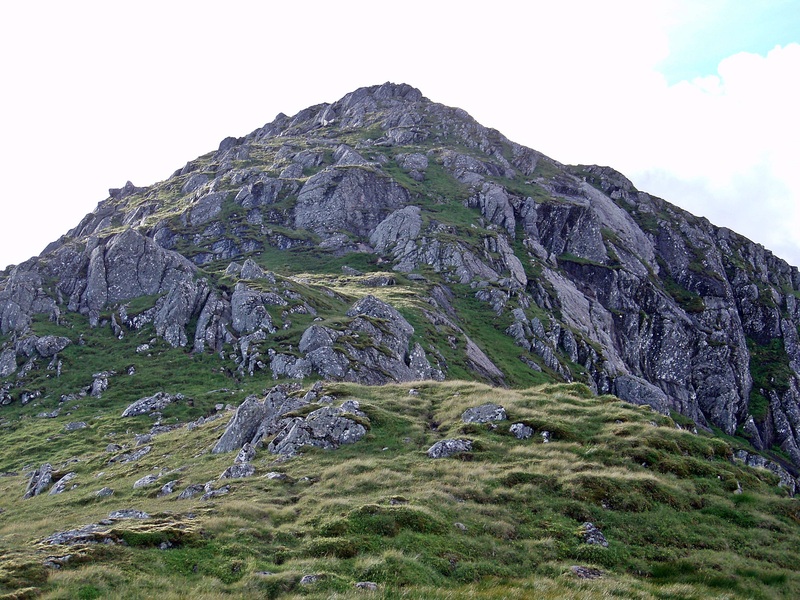 Ascent to the E Top. 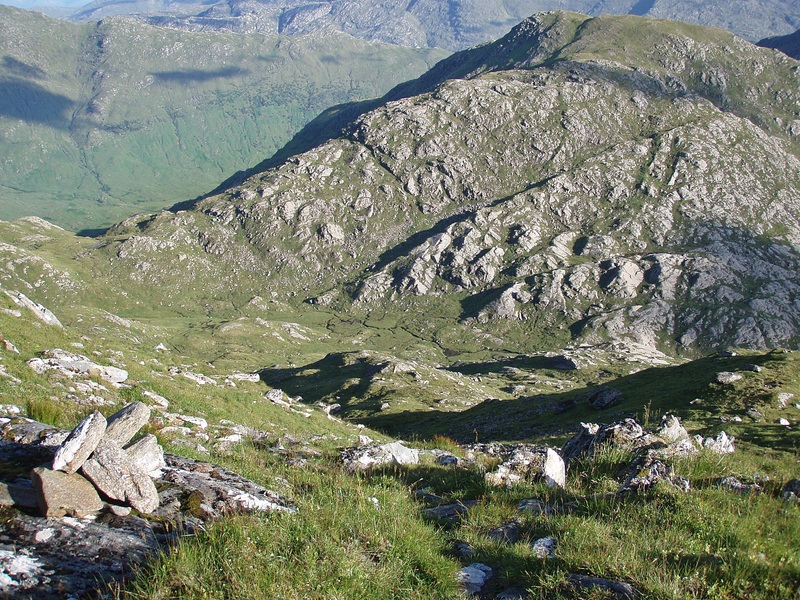 From the flat area below the E Top I could see my planned camp site on Bealach a’ Choire Odhair. 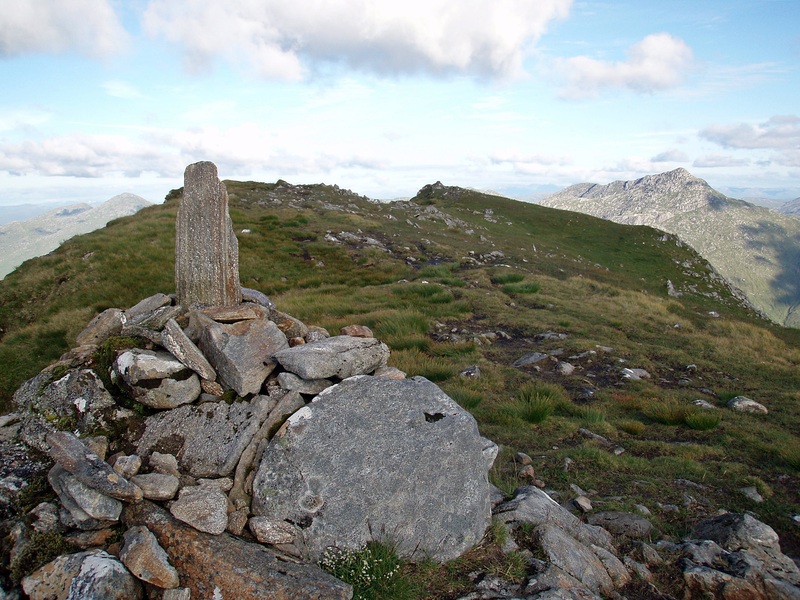 The first of three cairns along the ridge marks Luinne Bheinn’s East Top. 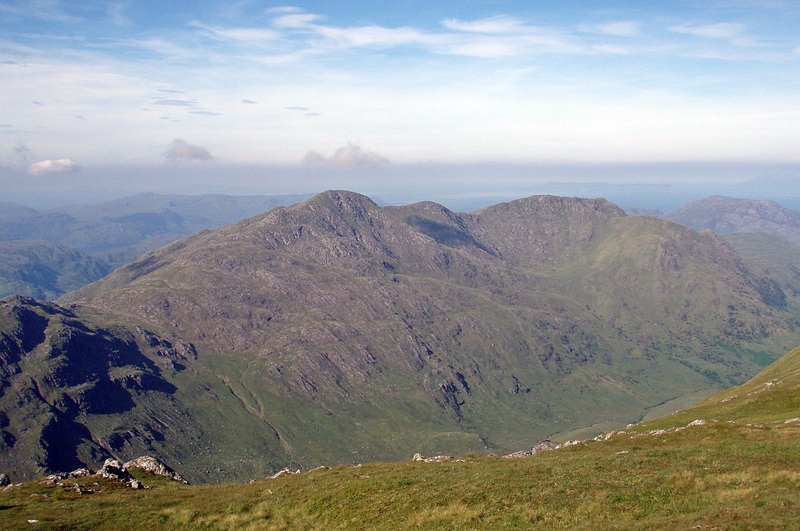 The middle one is the actual summit. 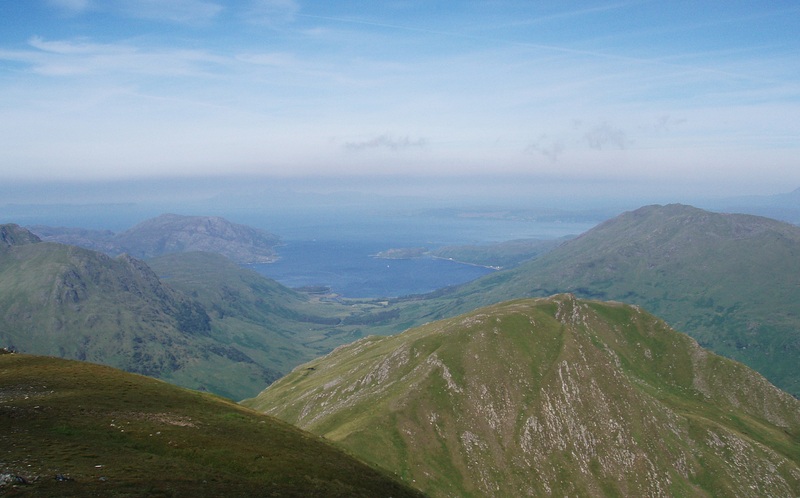 Looking down to Barrisdale Bay from Luinne Bheinn’s summit. 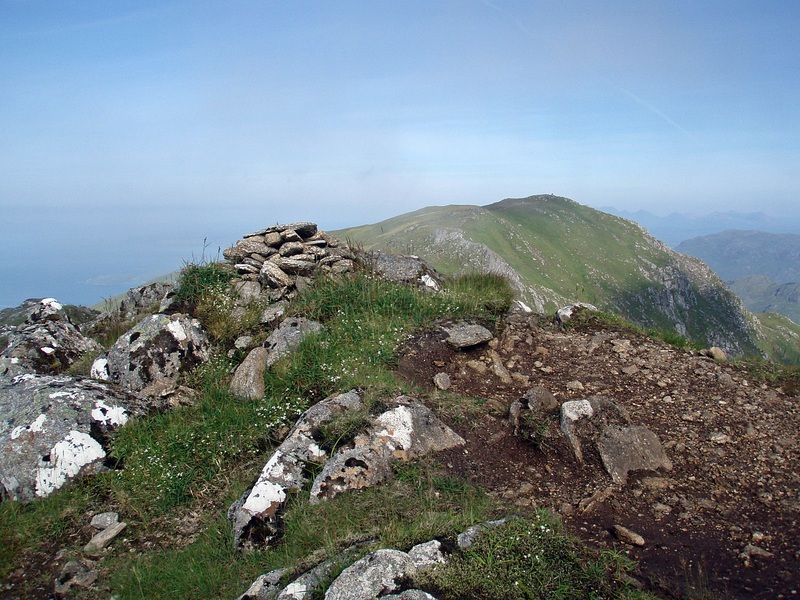 The third Cairn at the NW end of the summit ridge. There were now a few more tents at Barisdale. Lochan an Talamh Dheirg below Meall Buidhe looks like a beautiful spot for a wild camp but unfortunately it was not on my planned route. 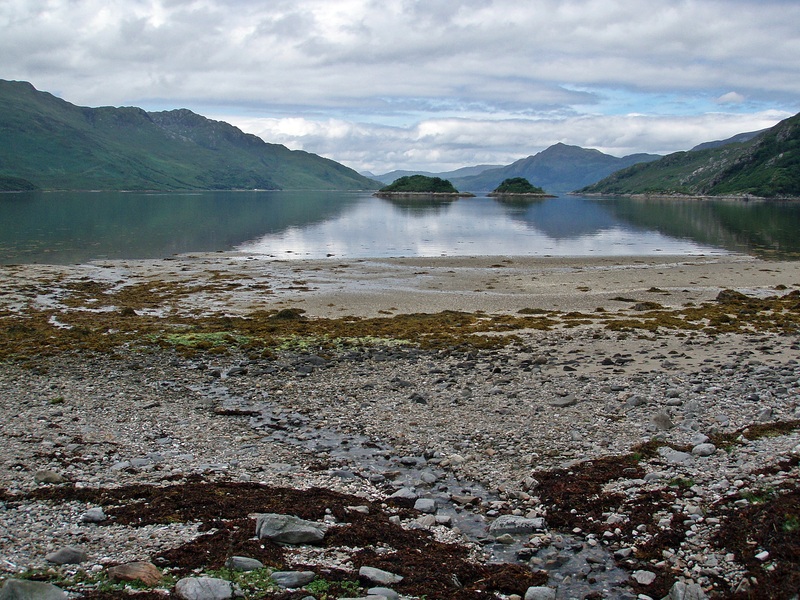 Loch an Dubh-Lochain and Inverie Bay. 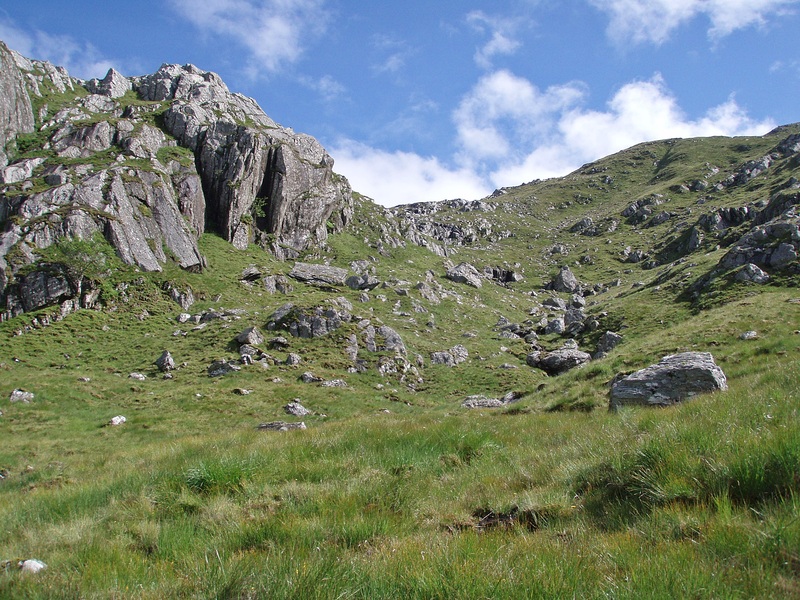 I had intended to retrace my steps along the ridge and descend to the bealach via Coire Odhar, but now this seemed like an unnecessary detour. 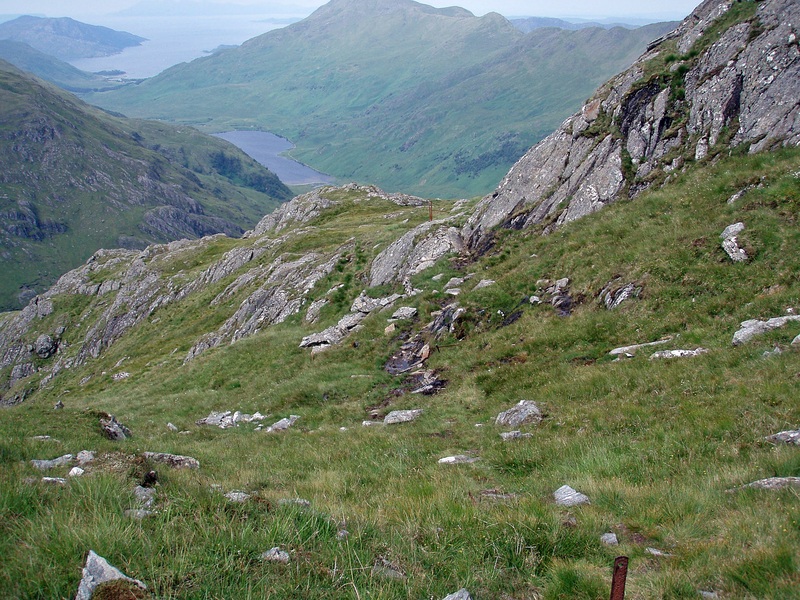 When I had climbed Luinne Bheinn for the first time a few years ago as a day walk from Inverie, I had kept following the line of fence posts around the foot of the hill until I realised that this path would not lead me to the summit. 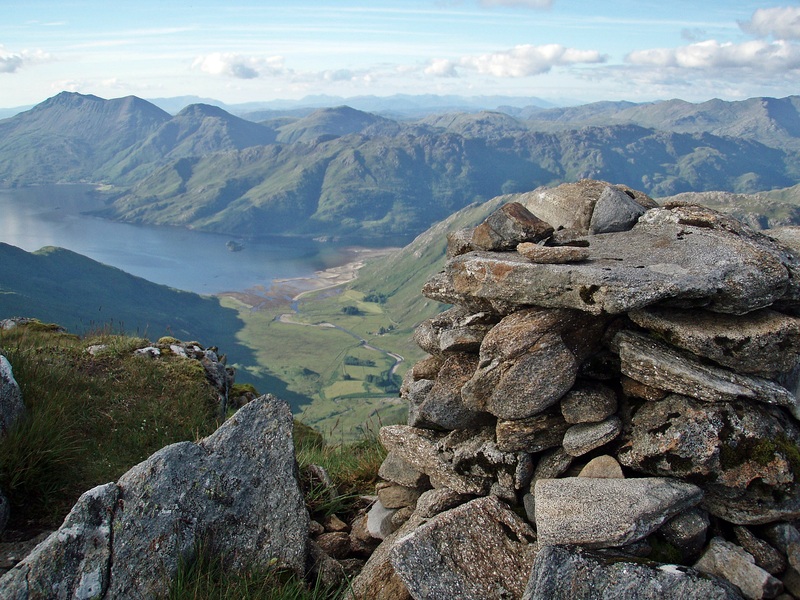 I had then climbed up an easy slope, arriving at the W end of the summit ridge from where it was only a short walk to the summit. 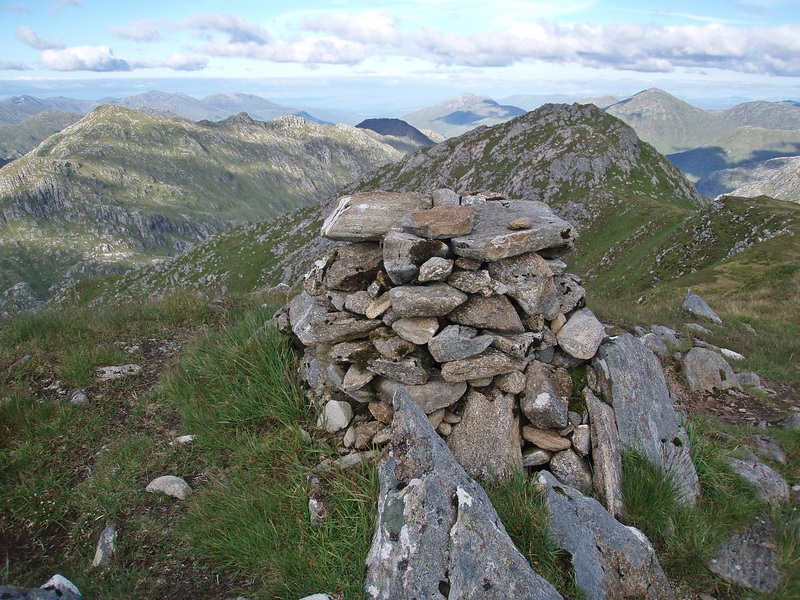 I decided to use this slope as a quick descent route, and after continuing along the ridge for a short distance I came across this cairn, apparently marking the start of the descent. 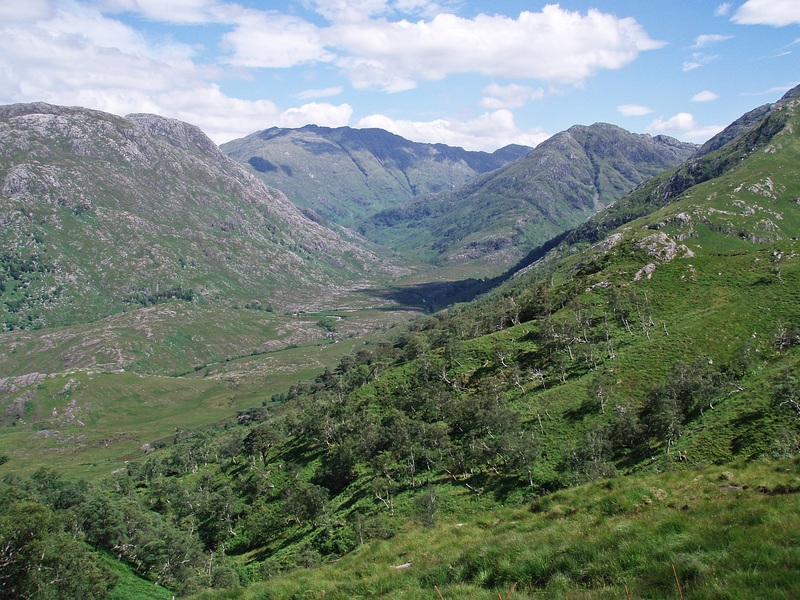 Close to the bealach I forded the Allt a’ Choire Odhair to which I would return later to collect water. 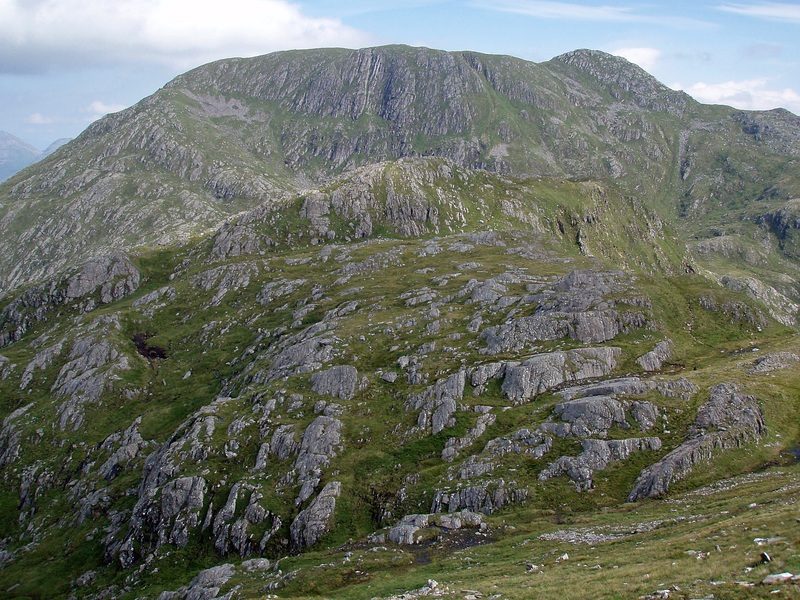 At 20:30 I arrived on Bealach a’ Choire Odhair and put up my tent. 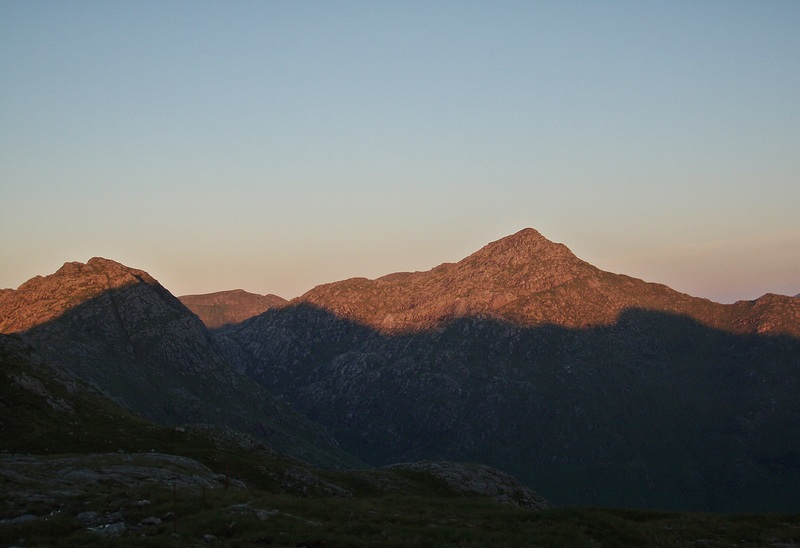 Last sunlight on Ben Aden and Sgùrr na Cìche. 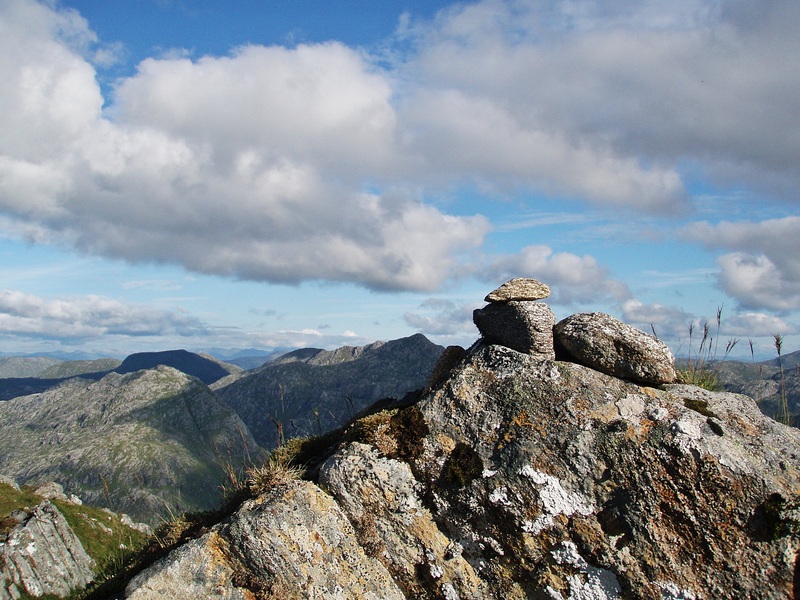 In the morning I packed my tent up and left my rucksack behind some rocks on the bealach, then I made my way towards Meall Buidhe with only a small day pack. 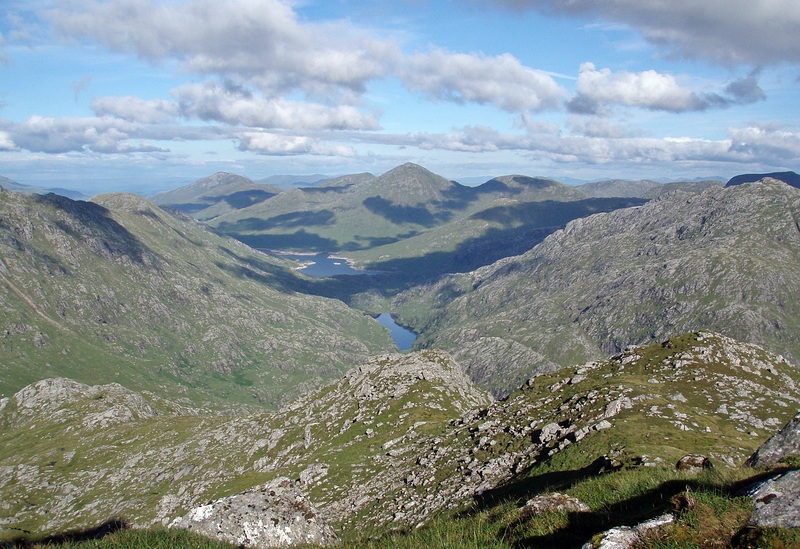 One of three tiny lochans on the way to Meall Coire na Gaoithe’n Ear, with Ladhar Bheinn in the background. 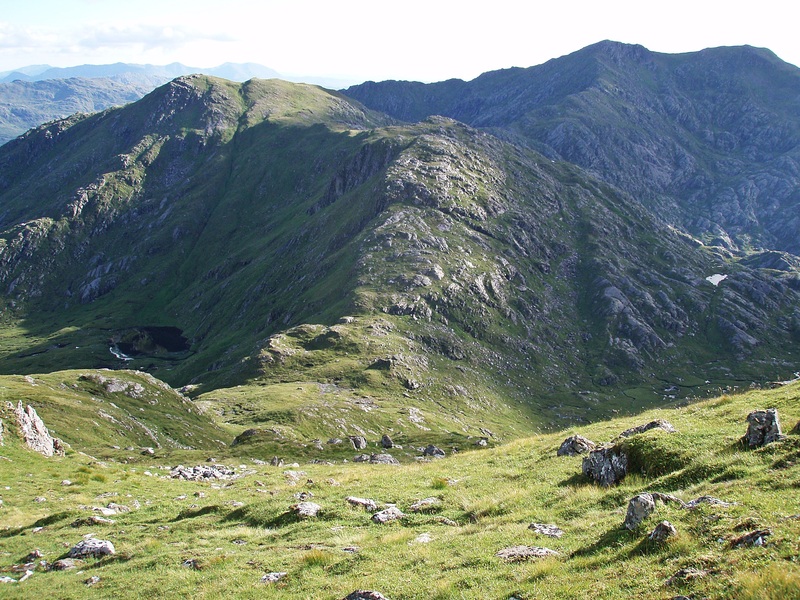 The wide grassy ridge leading to Druim Leac a’ Shith. Meall Buidhe’s SE Top obscured by a small cloud. 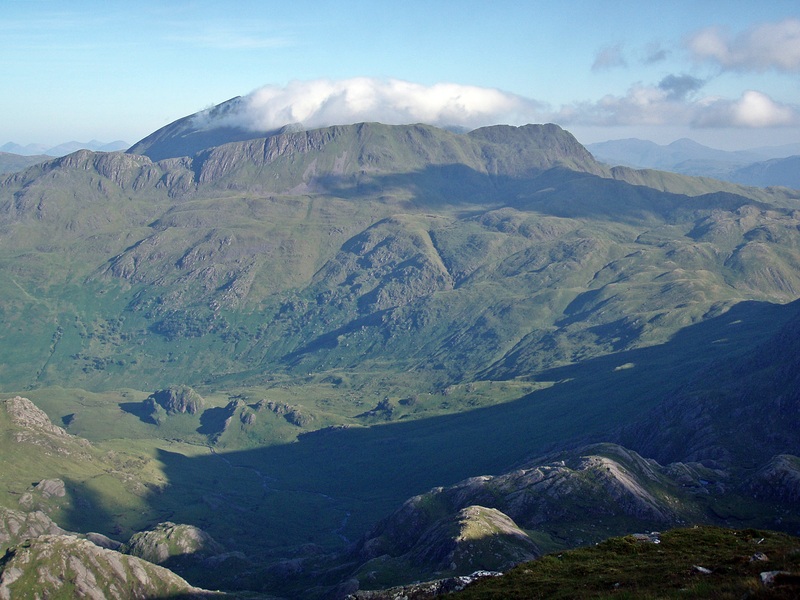 Ladhar Bheinn with a much larger cloud cap. 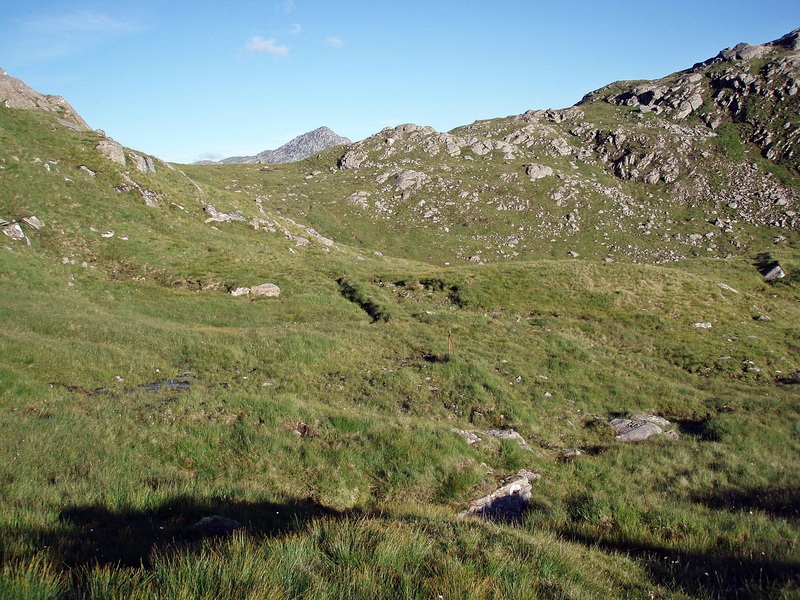 After Druim Leac a’ Shith the terrain becomes rockier but a small path winds its way through the crags. 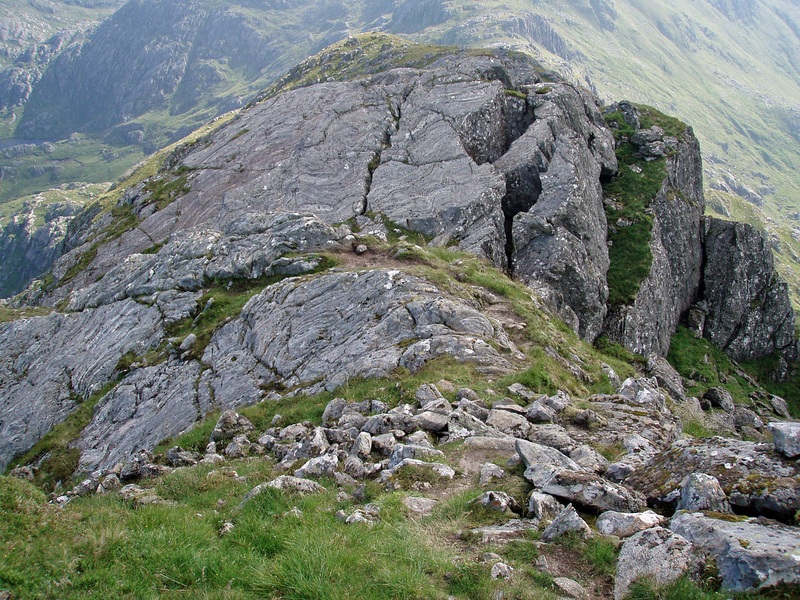 There are some scrambling sections to negotiate but none of them is particularly steep or exposed. 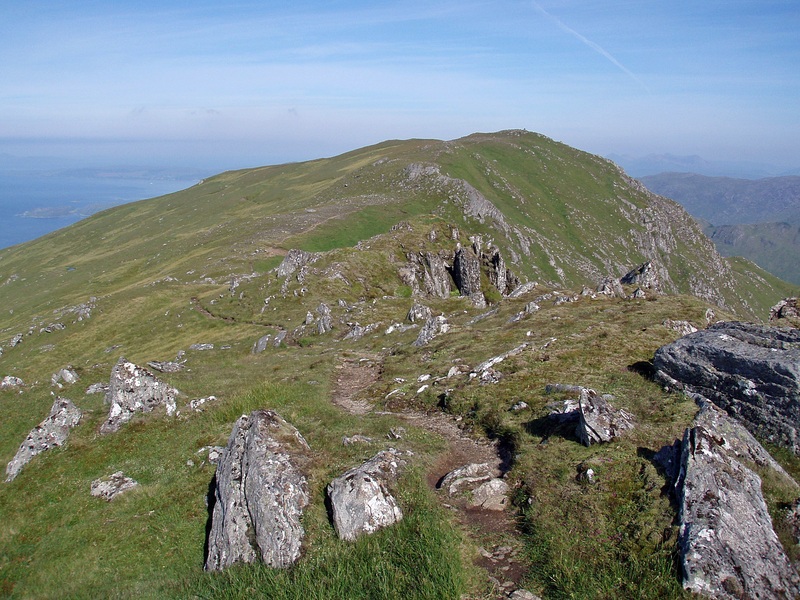 Easy walking towards the summit. 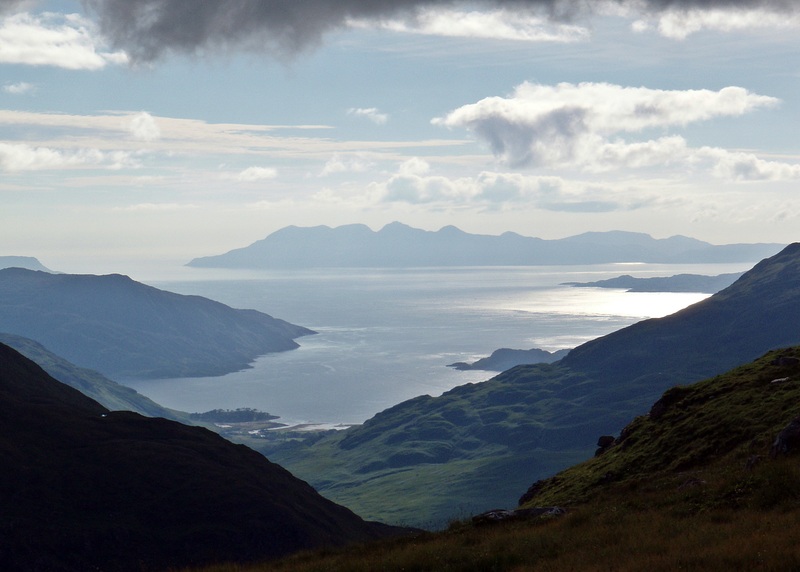 View W to Inverie Bay. It was quite breezy on the summit ridge, so I didn’t hang around for long. 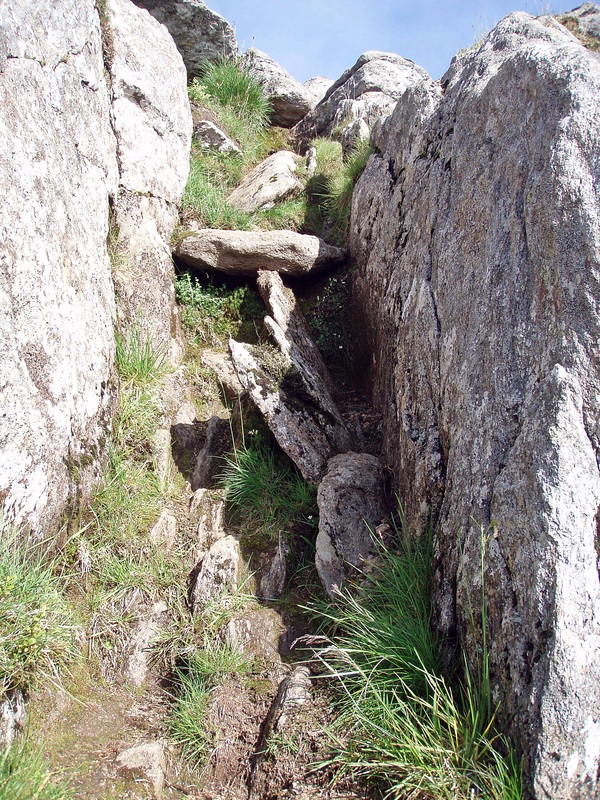 This obstacle can be bypassed on the left (N). 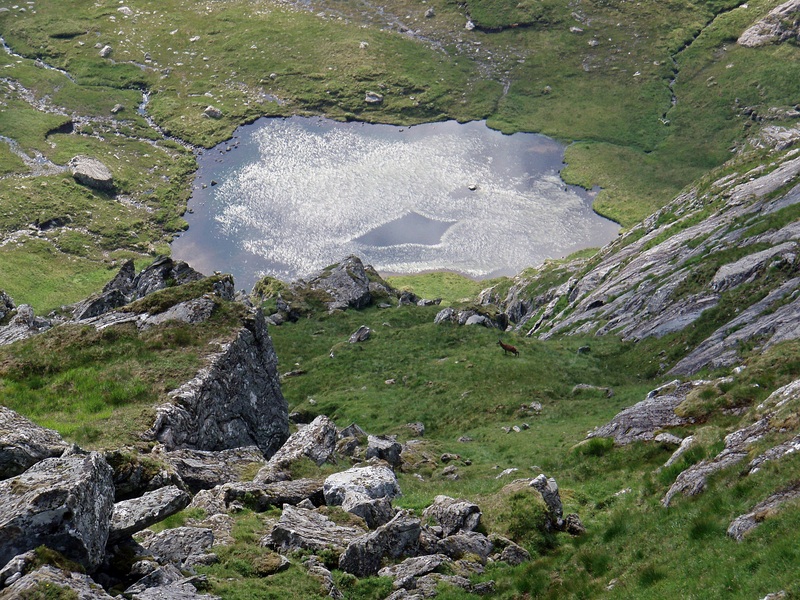 Unnamed lochan in Ile Coire. 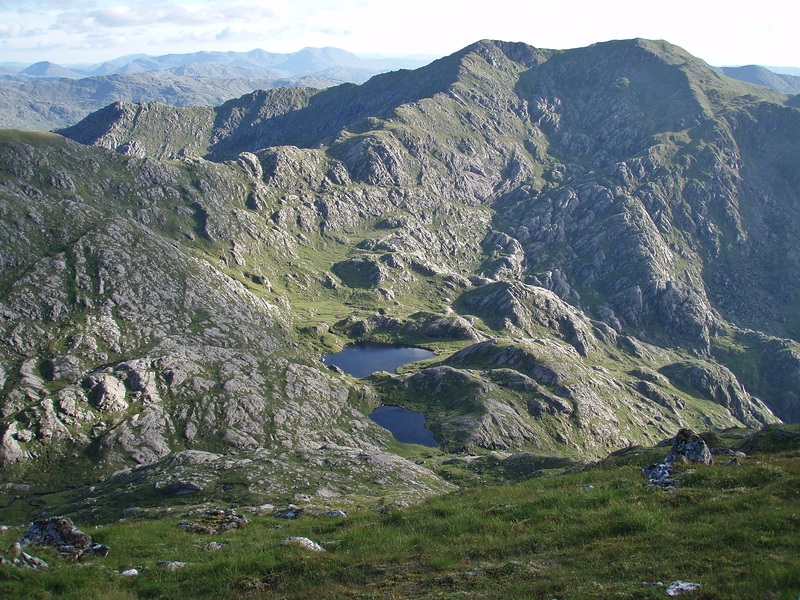 Although it doesn’t look that far on the map, it had taken me two hours to Meall Buidhe and two hours back to Bealach a’ Choire Odhair. 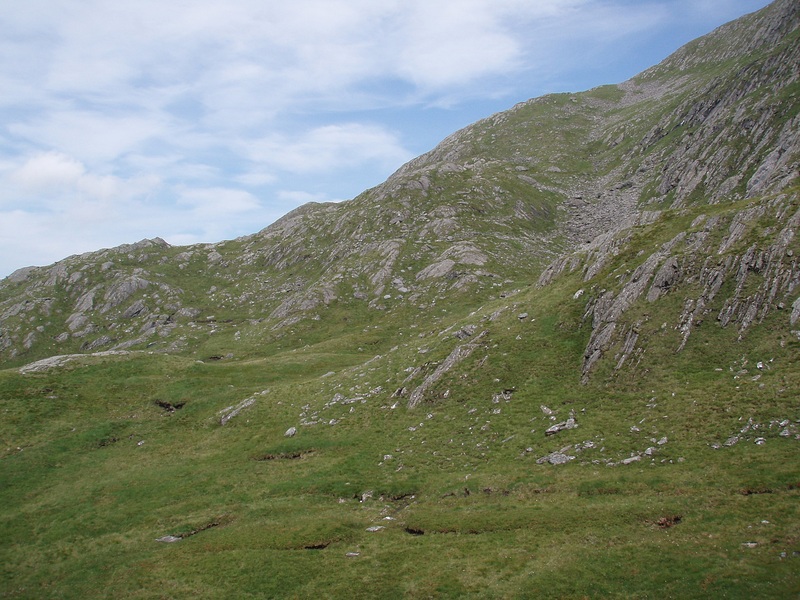 I collected my rucksack and climbed up the grassy ramp to the left of the photo – the higher one on the right had been yesterday’s descent route from Luinne Bhein. 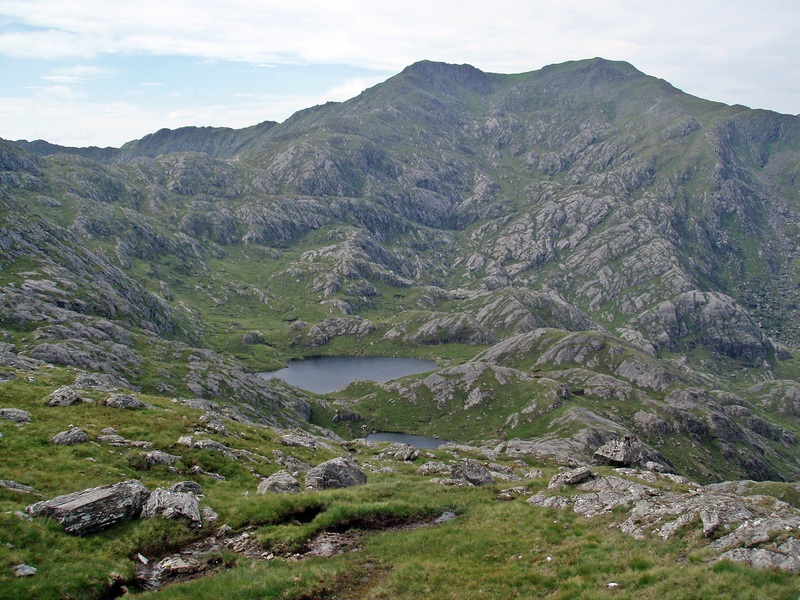 Meall Buidhe and Lochan an Talamh Dheirg. 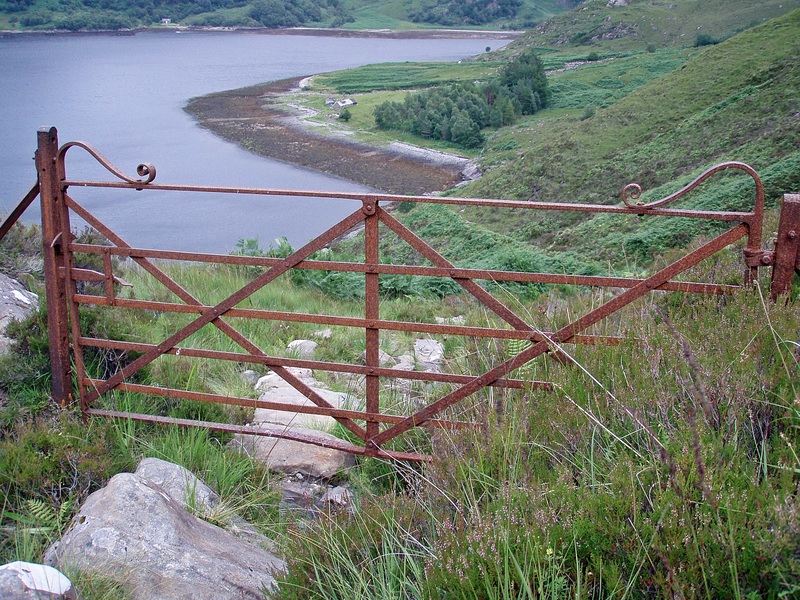 I followed the line of fence posts around the W flank of Luinne Bheinn. I joined the main path a little E of Màm Barrisdale. 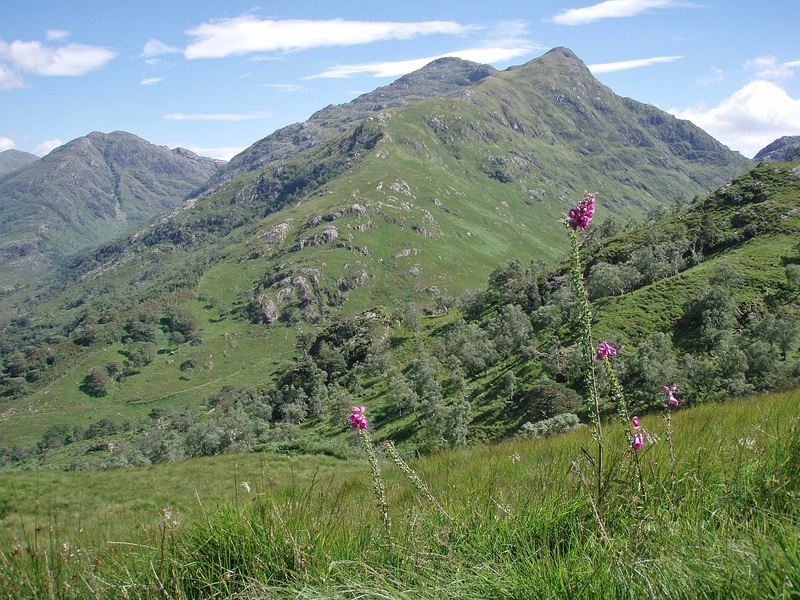 Back at the bothy, I carried a chair outside and had a long break sitting in the sun and enjoying a cup of coffee and some food. 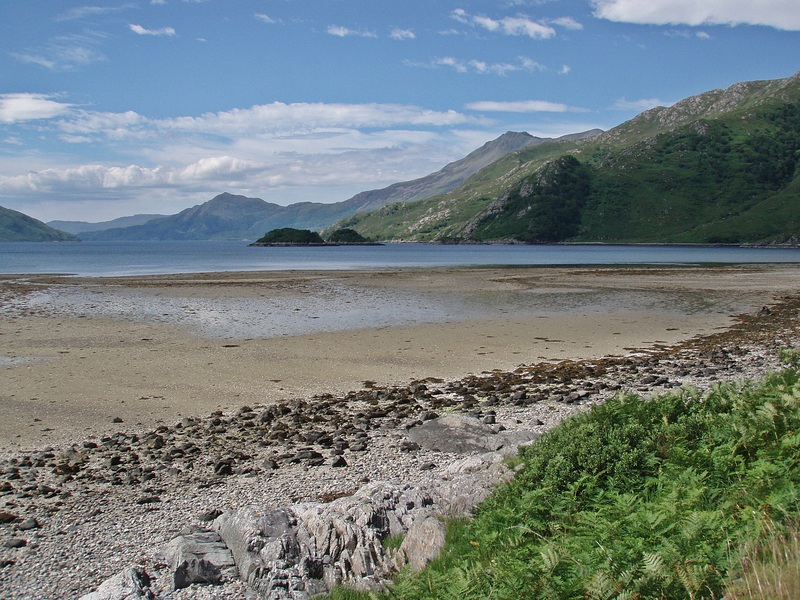 Then I continued around Barrisdale Bay, with a last look at Ladhar Bheinn. Today it really felt like being on a tropical beach – it was certainly hot enough for sunbathing! 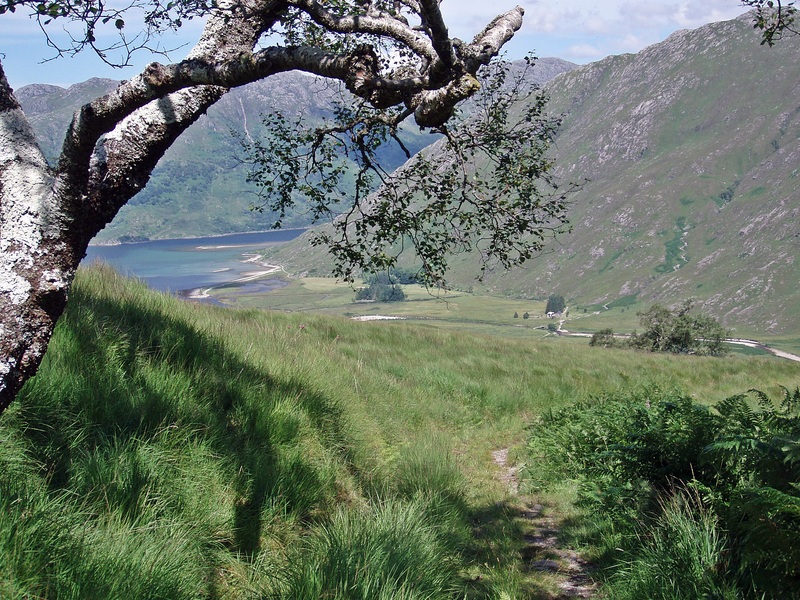 The path along Loch Hourn. 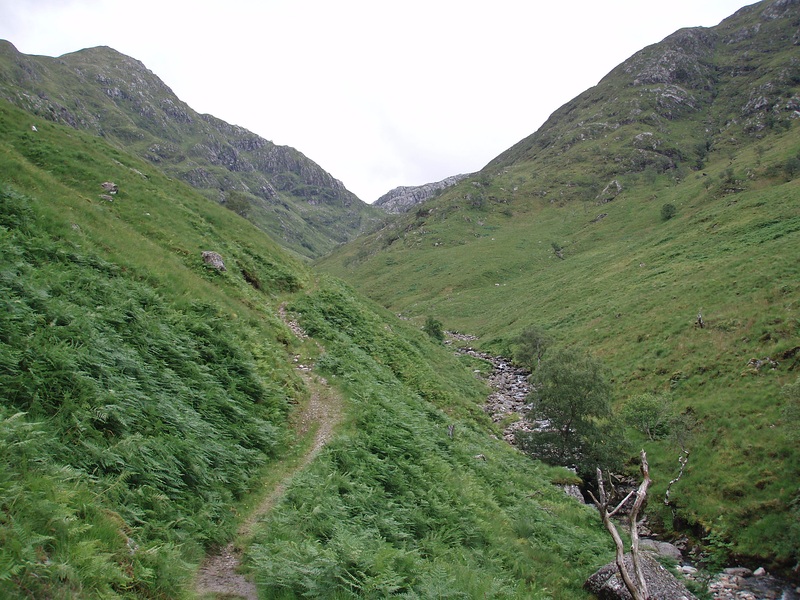 I really enjoyed this route combining the two hills but I’m glad I did it at a leisurely pace with a camp in between. 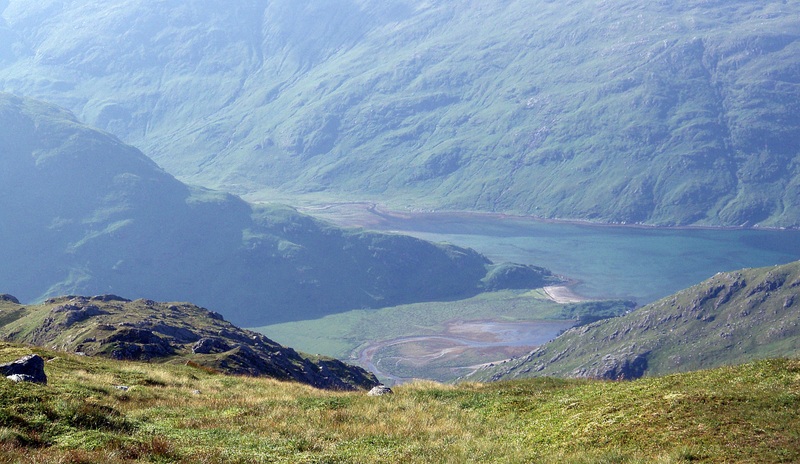 However, if based at Inverie or Barisdale, walkers with better stamina than me would certainly be able do this as a day walk. Some terrific photos. 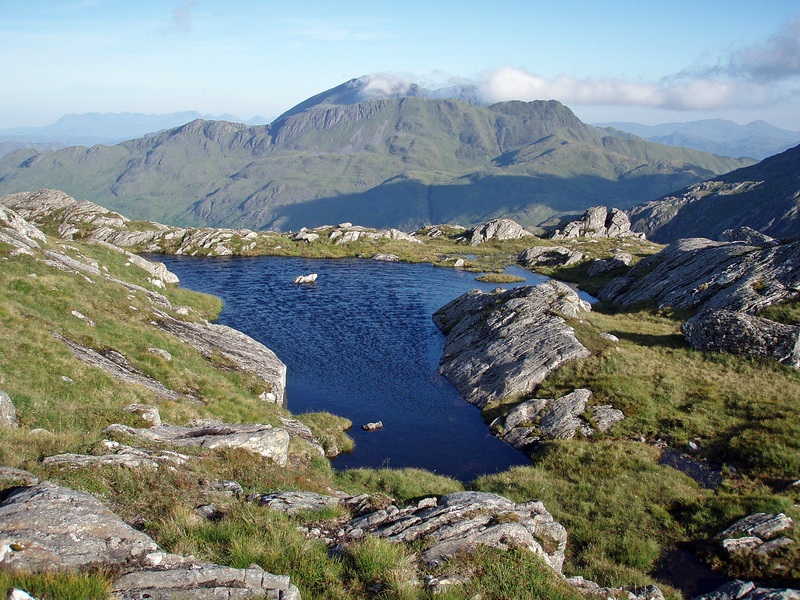 I want to camp at Lochan an Talamh Dheirg! 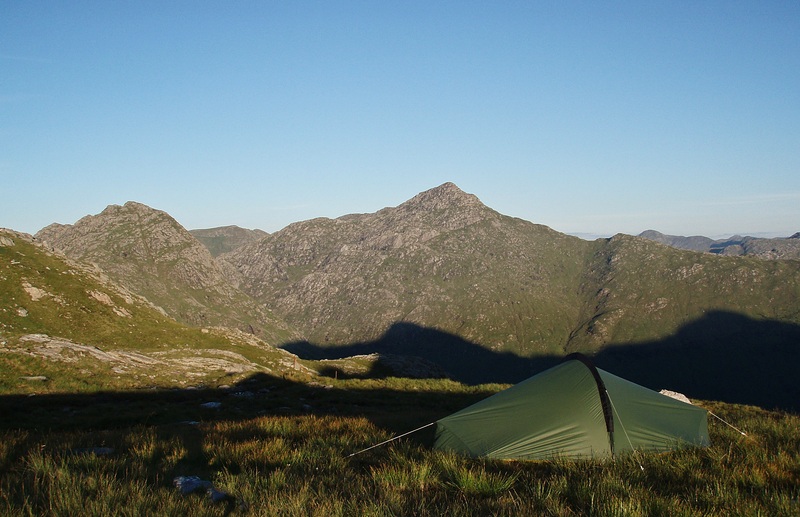 Thanks Robin – and if you do camp there, I’m already looking forward to a fantastic trip report! Superbly interesting post there. 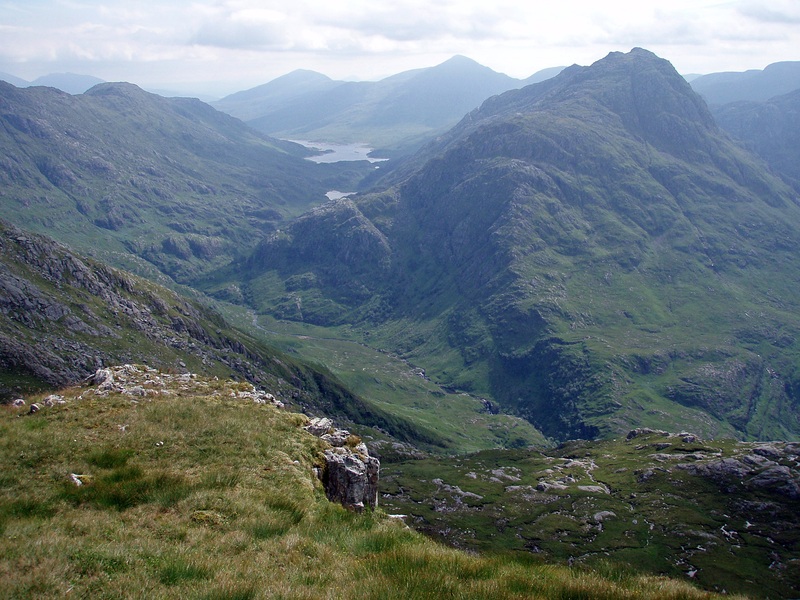 I wanted to do Luinne Bheinn and Meall Buidhe together but, the day I did Meall Buidhe, the weather was absolutely dire – severe gales, heavy rain and hail and no visibility whatsoever. 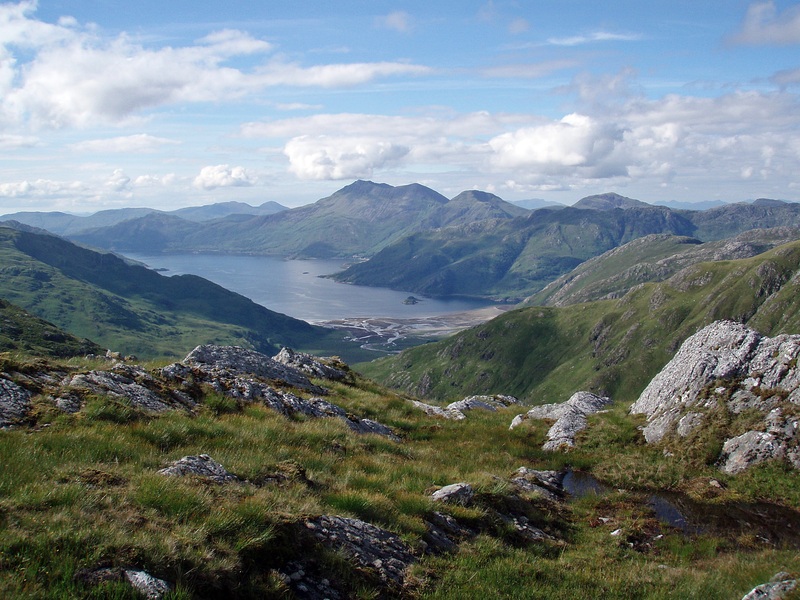 When I did Luinne Bheinn it was a much nicer day and I’d come up from Inverie and was tempted to do the round but, for some reason, didn’t. Your post makes me regret that. I’ll have to go back and give it a go. 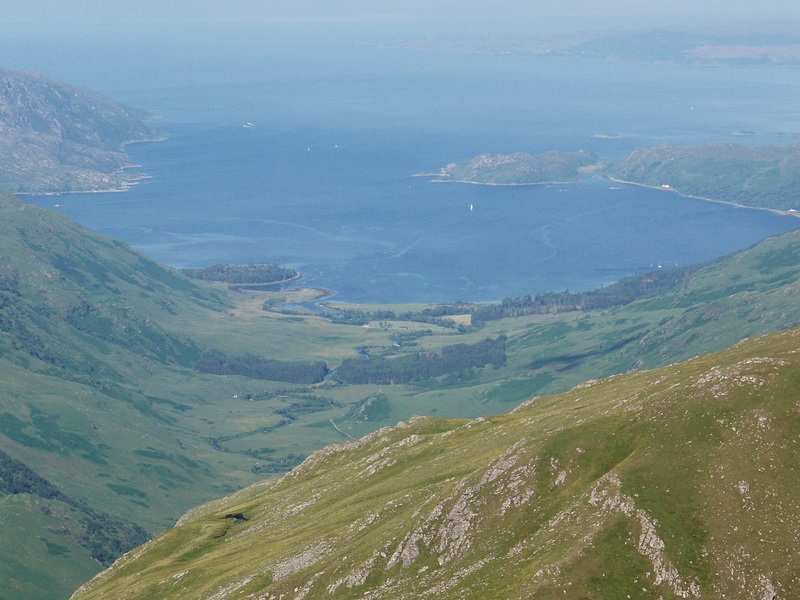 I’ll probably do the round from Inverie though… That connecting ridge looks superb! 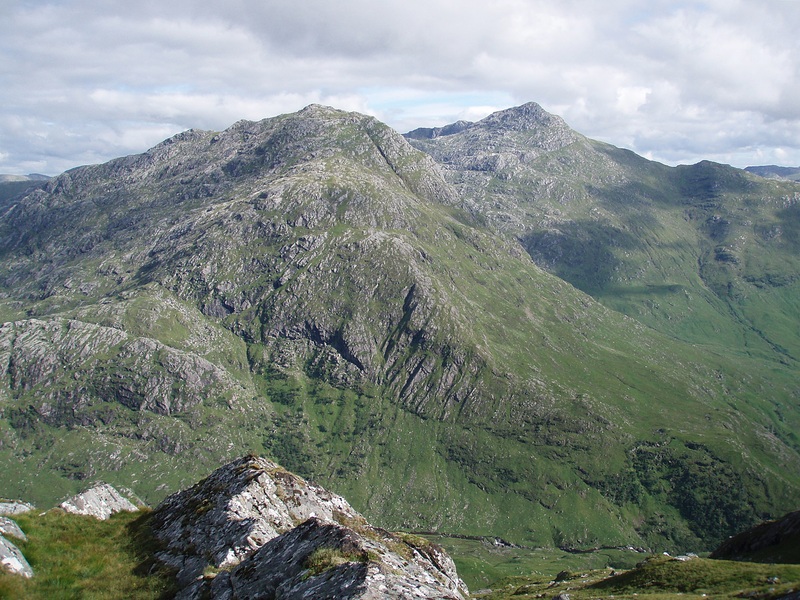 I’ve been wondering about when I do Ladhar Bheinn’s top which I missed – Stob a’ Choire Odhar. 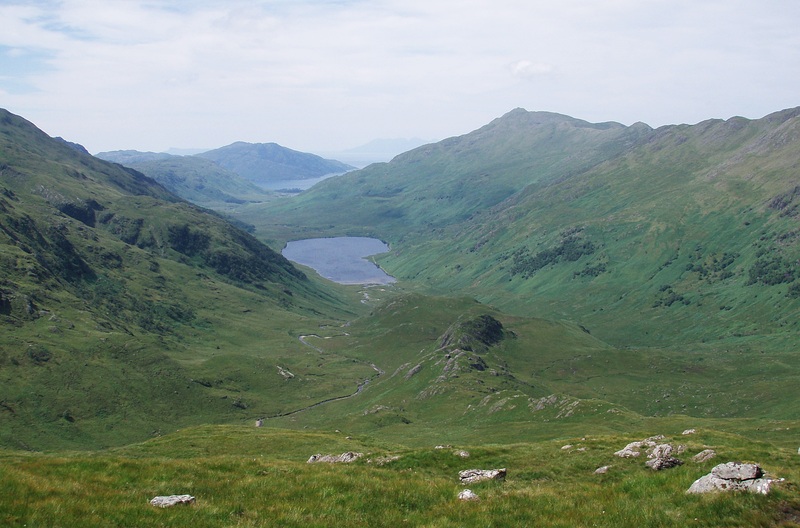 I was wondering how hard a walk it would be to walk in from Kinlochhourn, do the top and walk out again to Kinlochhourn in a day – what do you think? I’m definitely a plodder but it would be in August so a long day timewise. 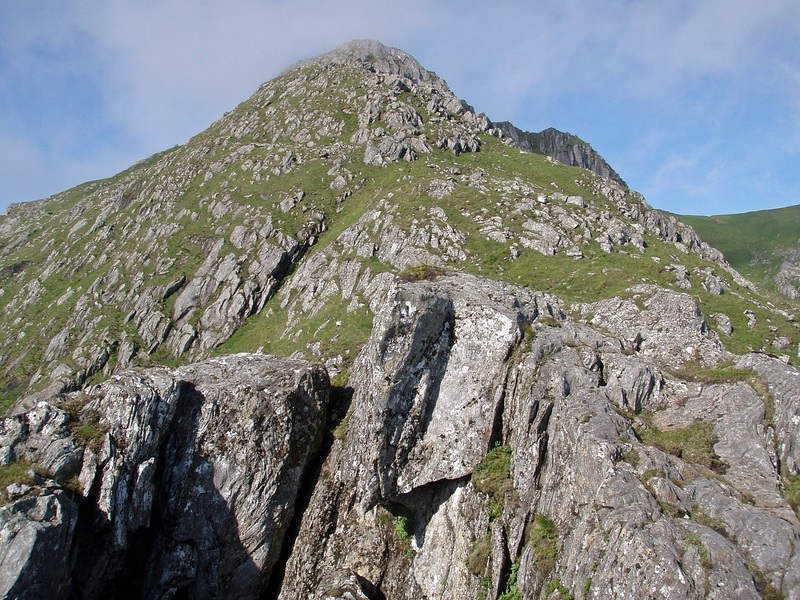 I took exactly the same route on Luinne Bheinn as you did the first time and for your descent this time. I’d also been following the fenceline and then it started to descend so I just headed up easy grass. 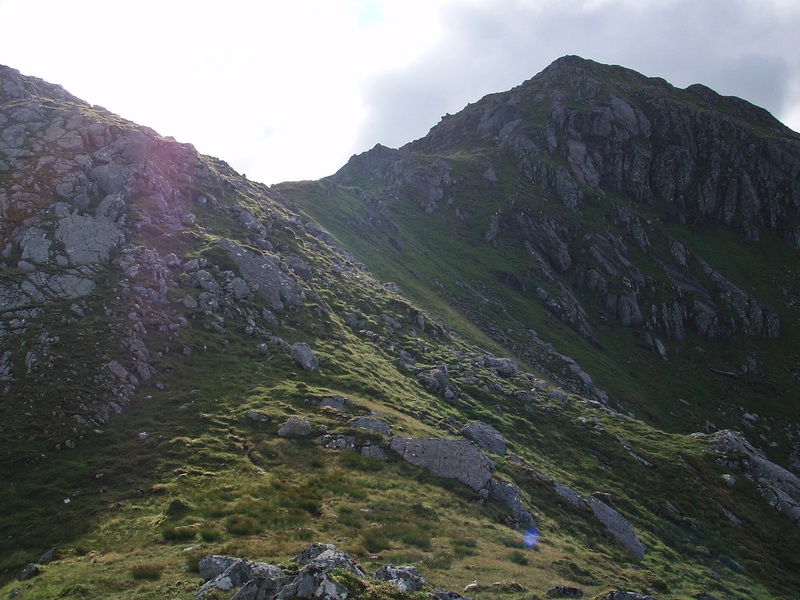 I was lucky there was an easy grass ridge as it was just next to where the crags under the summit started. 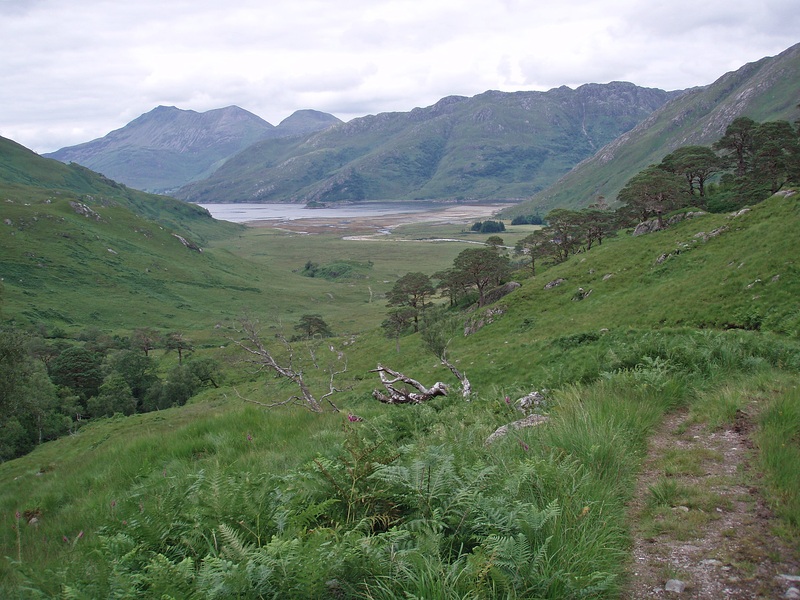 I’d reckon the walk in from Kinloch Hourn, up and down the Top and the walk out alone would take 11 – 12 hours (plus breaks), so it should be doable at that time of year. 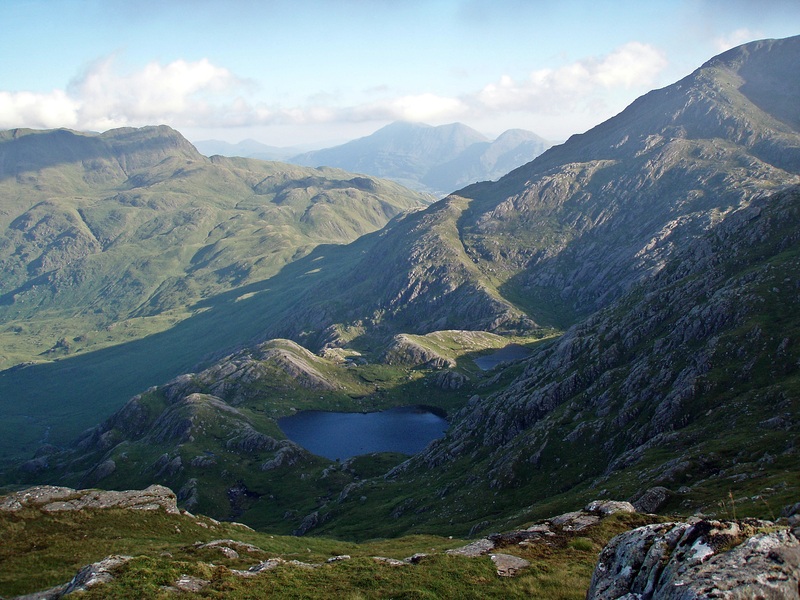 But it can be very hot in August, and with 33 km distance plus a lot of ascent it will be a strenuous walk! 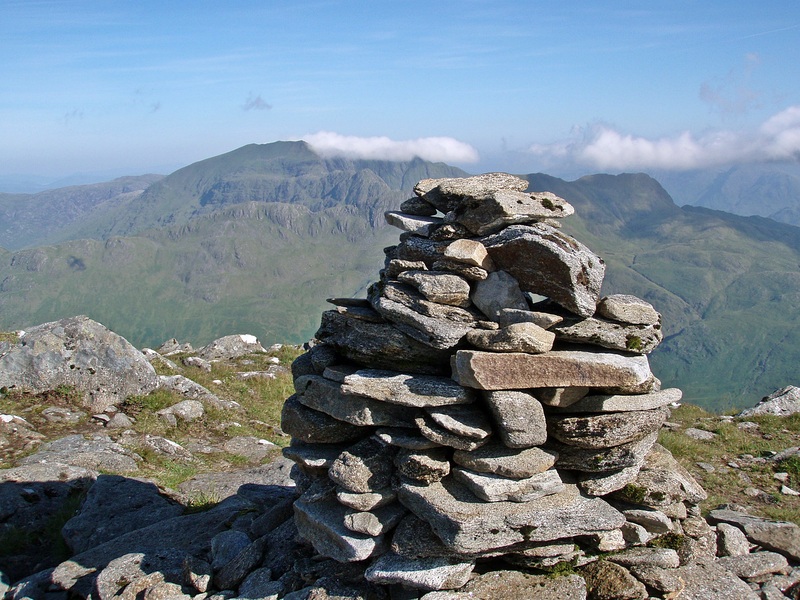 I was wondering about having another look at the map to see if it looked better from Inverie – presumably I’d then have to do the bit between the top and the summit of Ladhar Bheinn – can you remember how scrambly/exposed that bit was? It didn’t look too bad last time I was up there but it was very windy and I didn’t fancy adding it in. 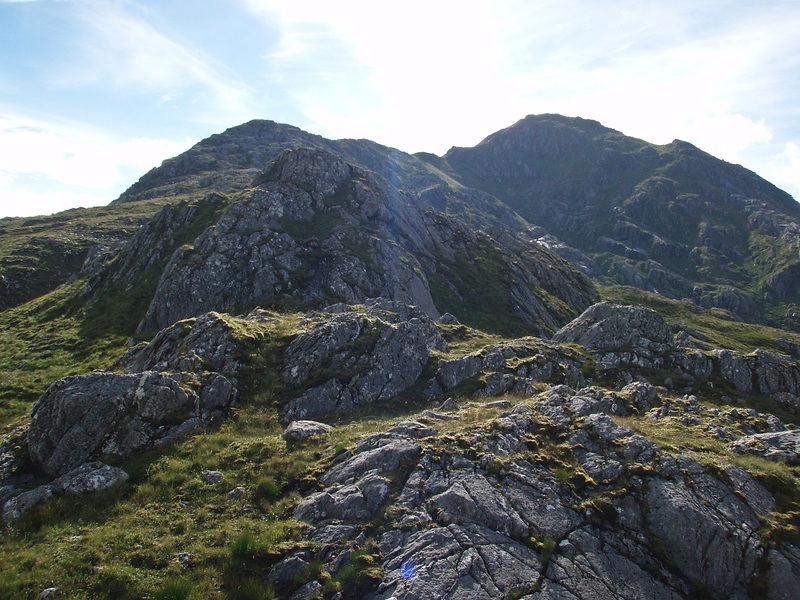 The section between the summit and the Top is just a narrow ridge with a path along it, no scrambling involved and – unless it’s blowing a gale – I wouldn’t say it’s exposed. 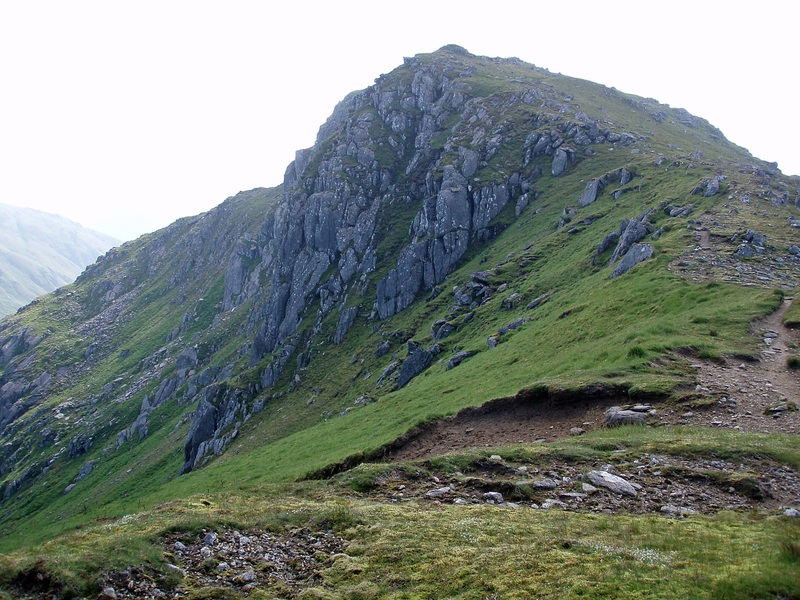 There is some “interesting” scrambling between the summit and Bealach Coire Dhorrcail but to get to the Top you don’t need to do that part of the ridge. 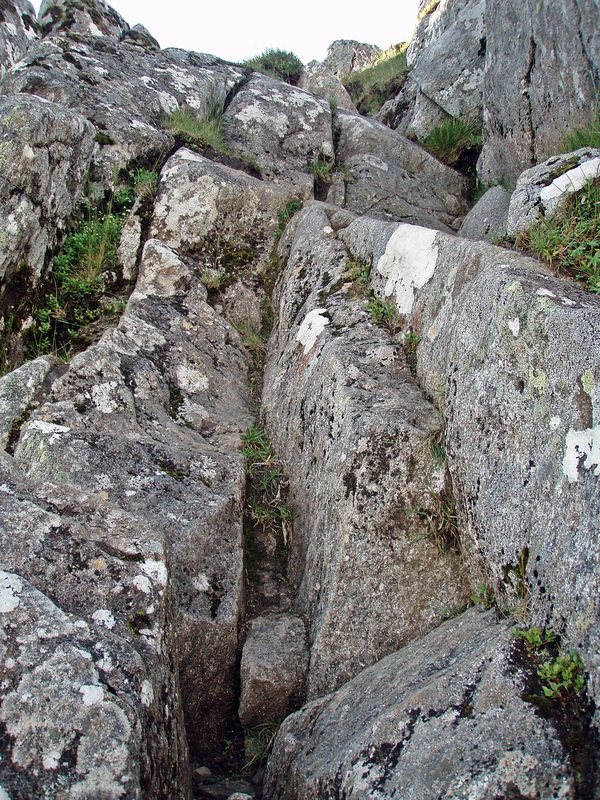 I’ve done the bit between Bealach Coire Dhorrcail to the summit and yes I did find some of it ‘interesting’ (just one section was awkward) but you’re right, I wouldn’t be redoing that bit. 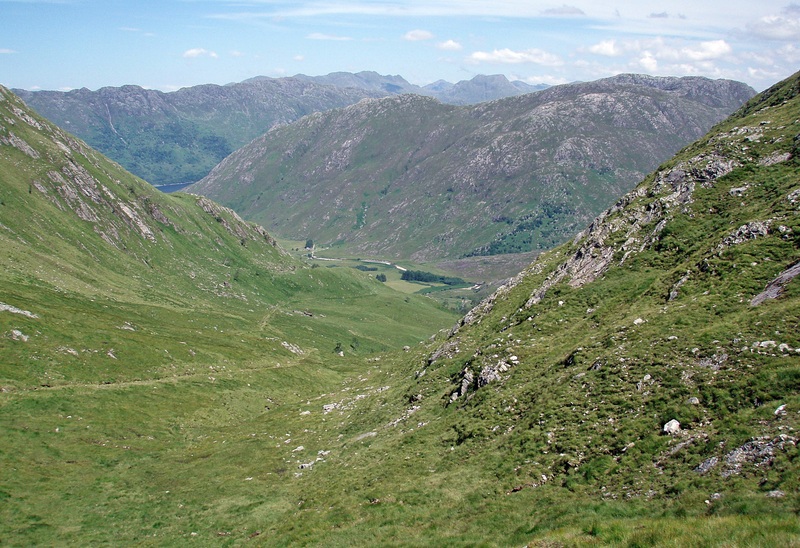 I was looking at possibly going one way up/down the normal route via Folach and the the other way down the far side towards Loch Hourn/Beinn na Caillich (if you know what I mean – not right to the coast, just down that side of the mountain – there looked to be a bit of a route – might be easier in ascent though). That looks like an interesting variation, but probably on very rough terrain and quite steep in places as well. 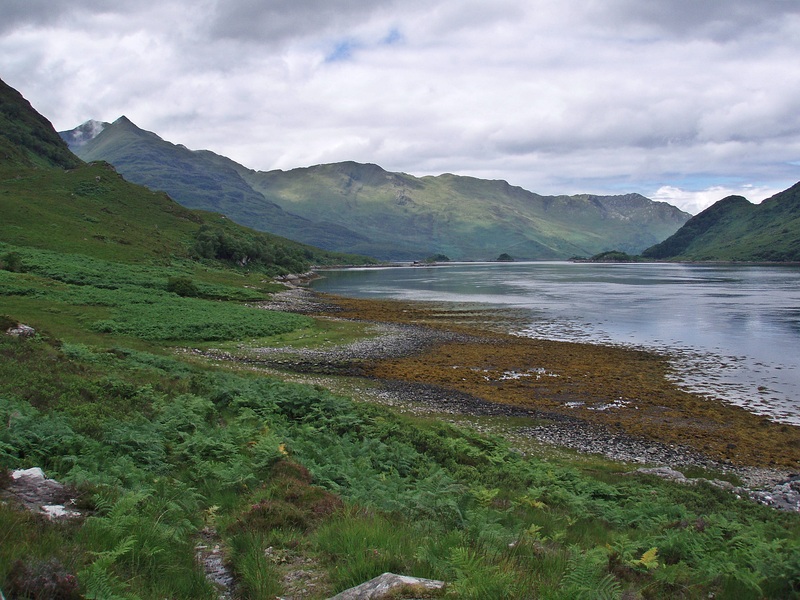 In that case I think it would take you longer than eight hours (between boats) and would involve an overnight stay in Inverie – which is not a bad thing of course, but it sounded as if you were keen on doing it in one day. 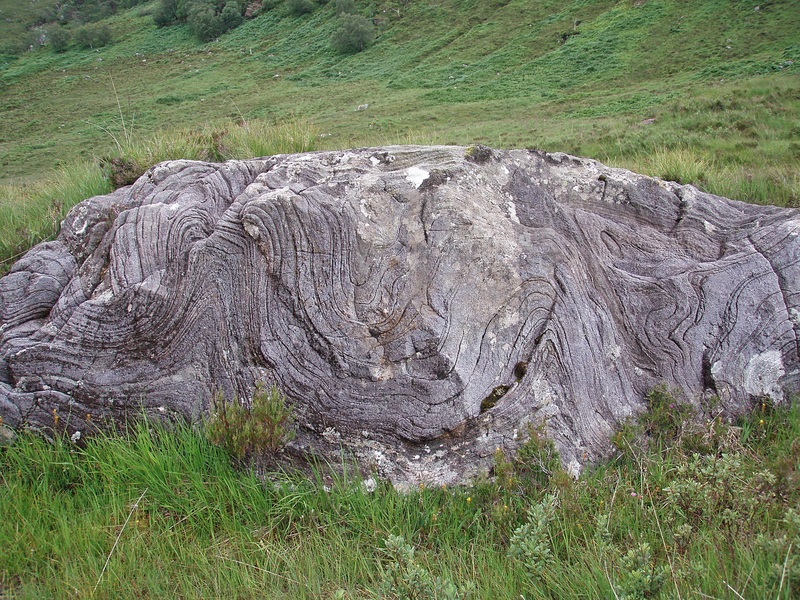 If I do it from Inverrie I’ll definitely be staying at least one night. I find it quite hard to get accommodation there though as the bunkhouses seem to be booked up all the time and the B&Bs are very expensive for a single traveller. 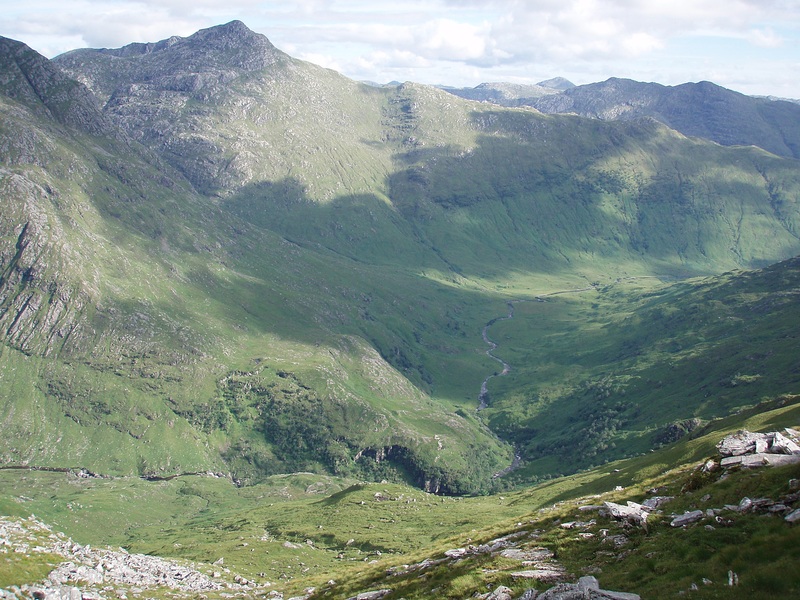 I’ve given it a lot more thought though and, although it’s much shorter from Inverie, I again wouldn’t see Coire Dhorrcaill properly and I really want to. So the long walk via Barrisdale it is. I’d prefer not to have to carry a tent but I’ll see how fit I can get before August. 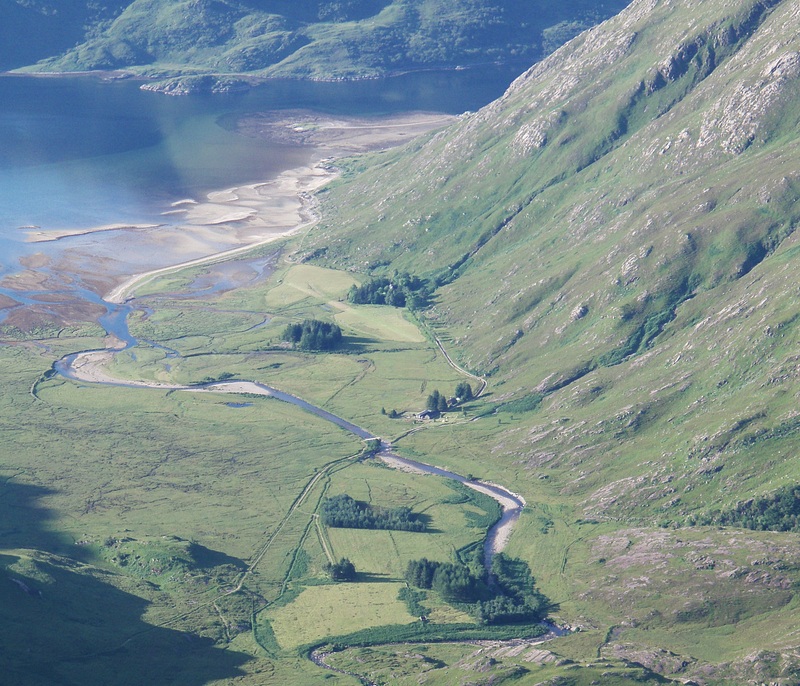 I agree about the B&B’s, I’ve never stayed in one in Inverie, but many times at the Foundation Bunkhouse. Normally I book well in advance, but a few times I just turned up and always got a bed no problem. 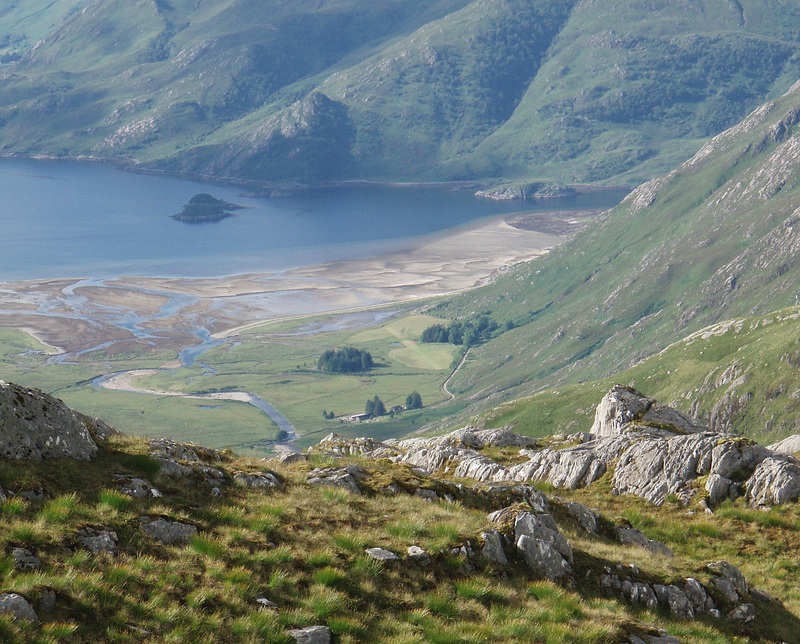 If you don’t want to carry a tent, you could always stay at the bothy in Barisdale (although that’s a bit of a risk as the bothy could be full as well). But there is also “The Stable” at the other end of the bothy that takes guests on a per person/per night basis if it’s not pre-booked. 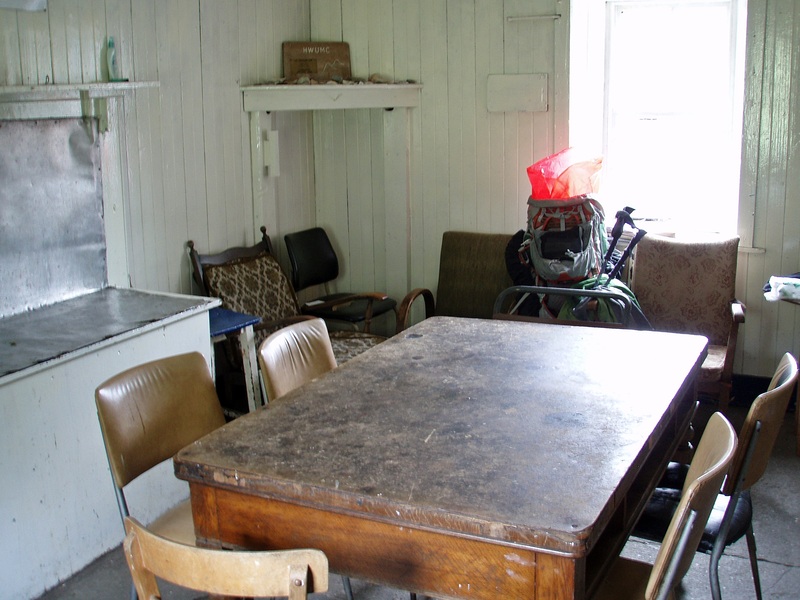 Didn’t know about The Stable – just the bothy. 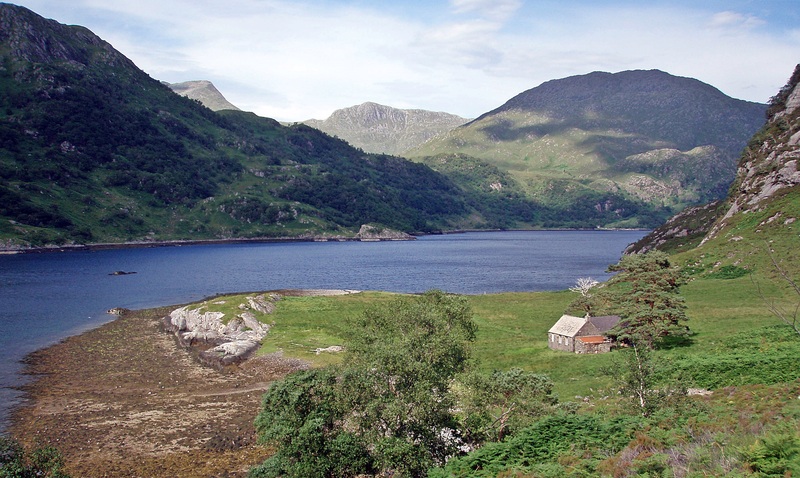 I didn’t fancy the bothy as there’s no fireplace and I believe there’s an electric light which I guarantee will get slapped on in the morning – I’m not an early riser as I can never get to sleep early. What’s The Stable like for facilities – do you know? Thanks for the link Nicole – I’ll have a look at that. 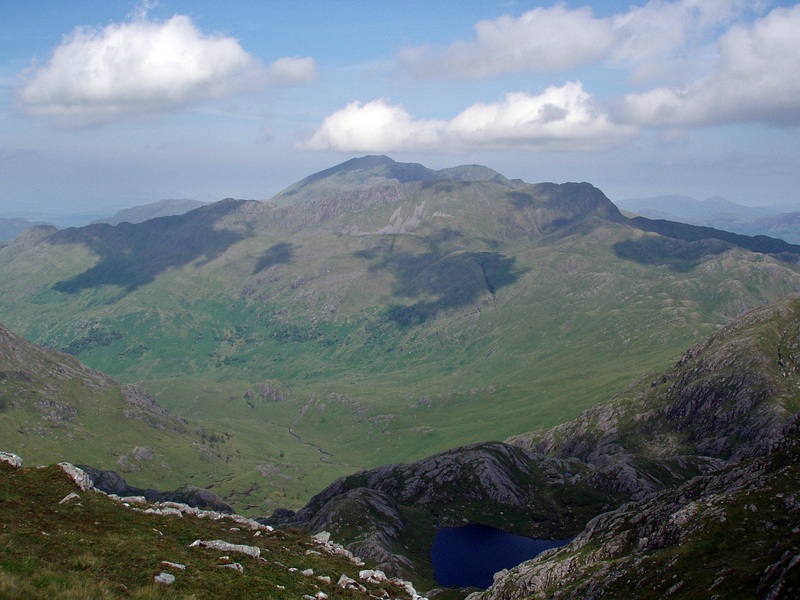 I had a bit of knee trouble the other day on my first day back in the higher mountains of the Lakes so I’m hoping I’m not going to have an ‘unsound summer’ – that will really put the kibosh on my plans for the year! That doesn’t sound good – I really hope that it’s nothing serious and that your knee(s) will feel better soon! Fingers crossed that we both recover in time for the walking season! My knee was only bad (but very bad) for 2 days. We went out on a gentle walk after that and it was fine. We were mainly walking on soggy grass though and no big ascents or steep ground. It’s completely fine now but I’m looking on it as a warning to really build up some muscles around my knee before I start my season properly! I still have that niggling groin which sometimes suddenly goes weak and other times is fine. Weird. Let me know what the verdict is from your x-ray. My groin’s been niggling for a couple of years now. Good to hear that at least your knee is ok now! Suffering for a couple of years is a long time – I don’t think I could put up with this for that long as I am struggling to walk up the stairs let alone hills… Will let you know about the outcome of the x-ray (by email). Well I’m not really suffering with my groin strain as such as it’s mostly okay – just I can’t trust it as my leg suddenly collapses sometimes. 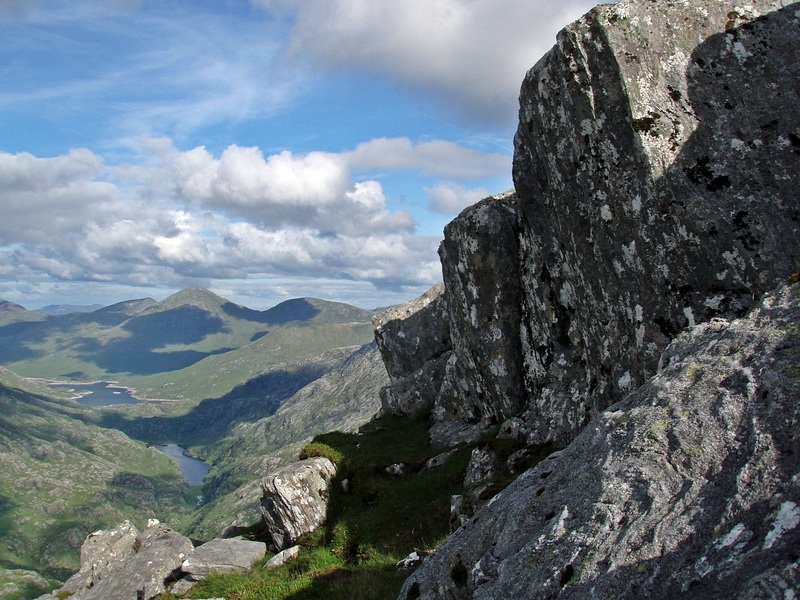 I’m dreading an episode of that on the Cuillin!